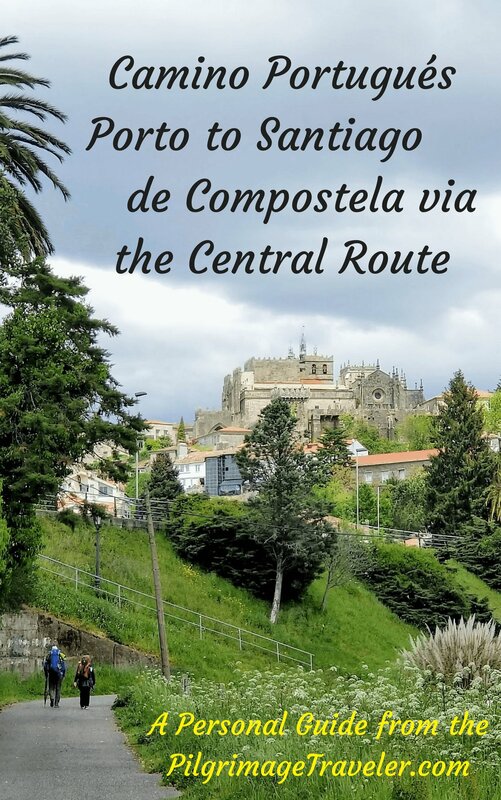 Our day seventeen on the Central Route of the Camino Portugués was a very long walk for me. It was however, full of charm and our ongoing camaraderie which made the miles go by quicker than otherwise. 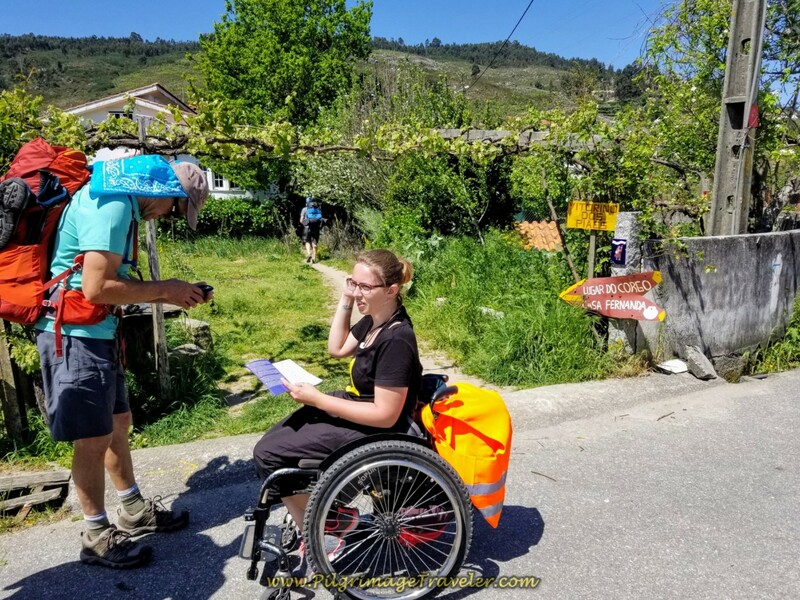 We continued to help Magdalena, however, she made her own road as well, with the assistance of the amazing Fernanda, a Portuguese Hospitalera. 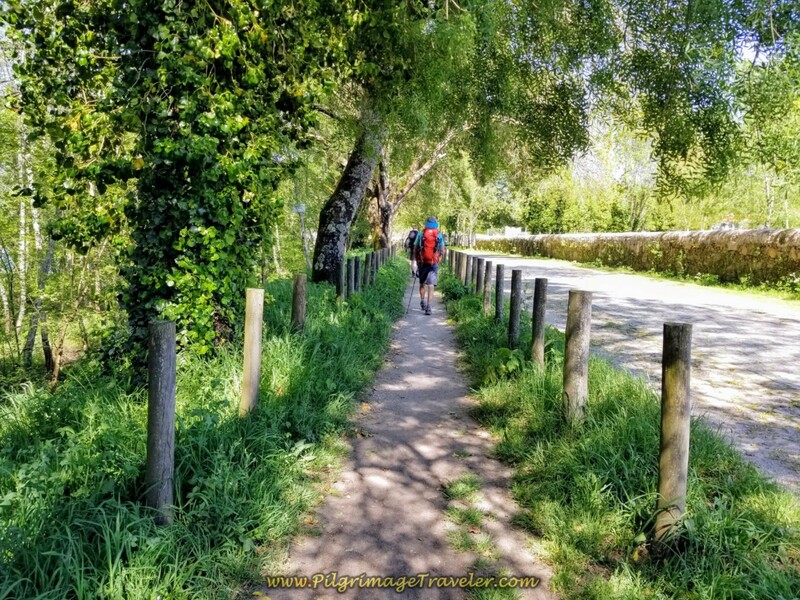 Indeed, the road is your own, and in the end, you must walk it yourself, both physically as on this day on the Camino, as well as metaphorically on your spiritual journey through life. Others make it easier, but cannot complete it for you. Such would be the case for all of us. Here is our Google map from my uploaded GPS tracks. 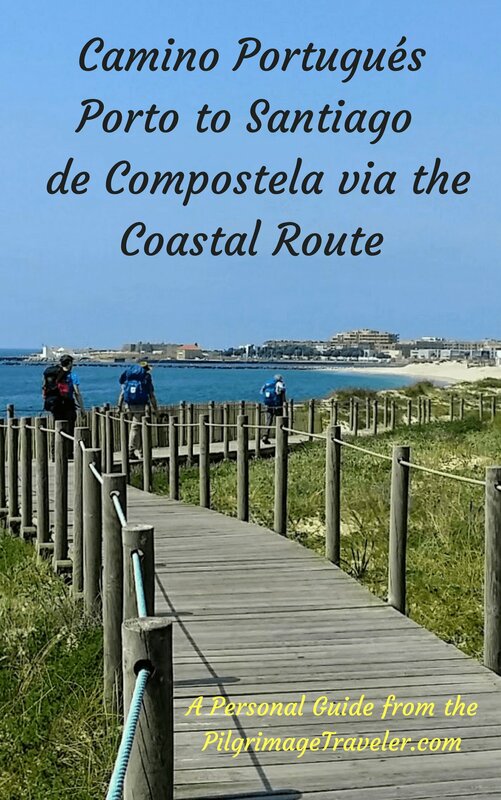 I also placed the accommodations, supermarkets and cafés on the map that you will encounter as you walk along. As you can see on the elevation profile, there are several significant climbs, accumulating 700 meters. 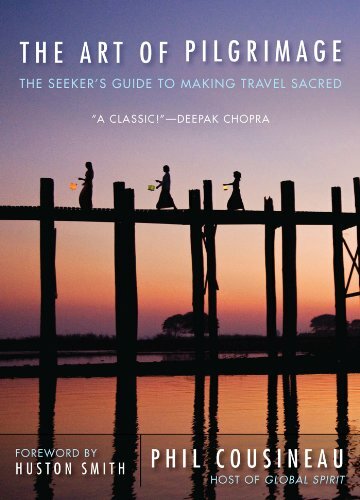 Add this to the length of the day and if you complete this entire stage, you will feel it. I took the day, step-by-step and would have stopped if I had needed. There are many accommodations along this stretch as you can see from the above map, so the day can be as long or as short as you need. Because of the length of the day, Rich, Matt and I got an early start at 0700. Our chair-bound friend, Magdalena had already left earlier. We knew we would catch her on the first uphill. Magnus, as usual chose to sleep longer and catch us along the way. 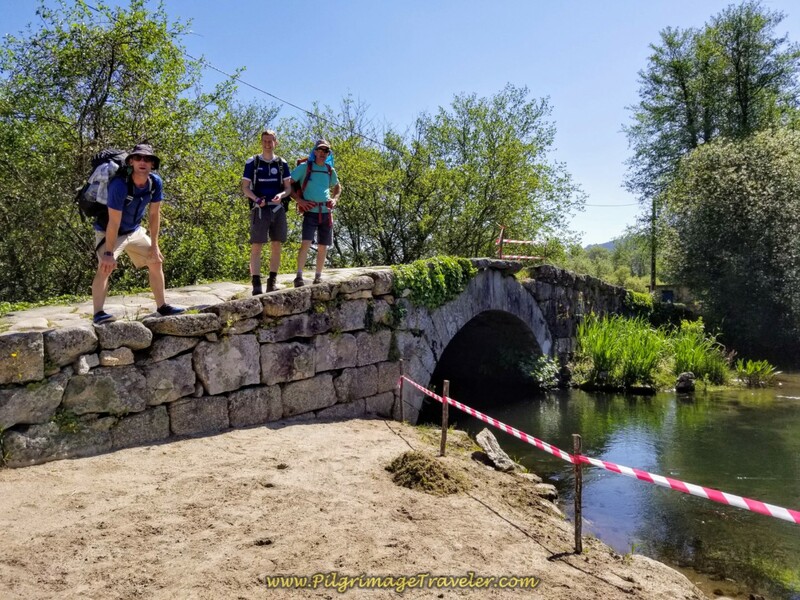 When we left our albergue in Barcelinhos, it had just become light as we crossed the bridge across the Cádavo River. 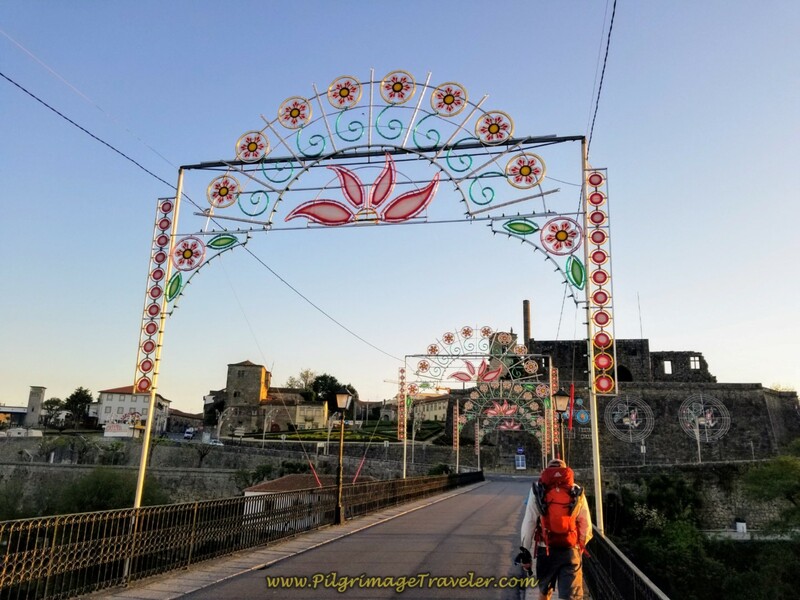 The town was decorated for the annual Festa das Cruzes, the Festival of the Crosses, held the end of April and early May, every year. What was once a religious celebration is now a secular one with parades, food costumes and fireworks. 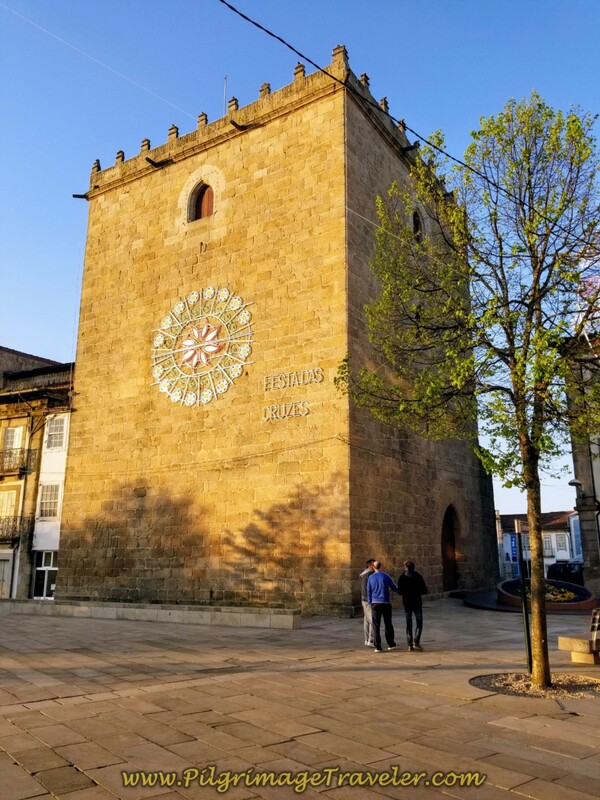 After crossing the river, you turn left to climb the hill to the main cathedral, the Igreja de Matriz de Barcelos (see day sixteen). 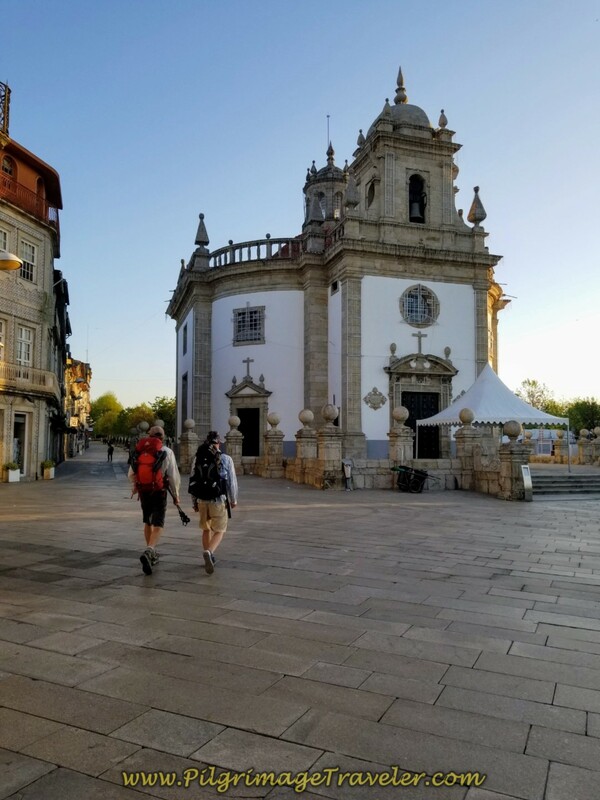 After rounding the cathedral to the left, you will see the waymark below, directing you onto this pedestrian way called the Rua São Francisco. (This photo I took the evening before). Continuing to follow the waymarks, we turned right to continue on the main shopping pedestrian street, shown below. 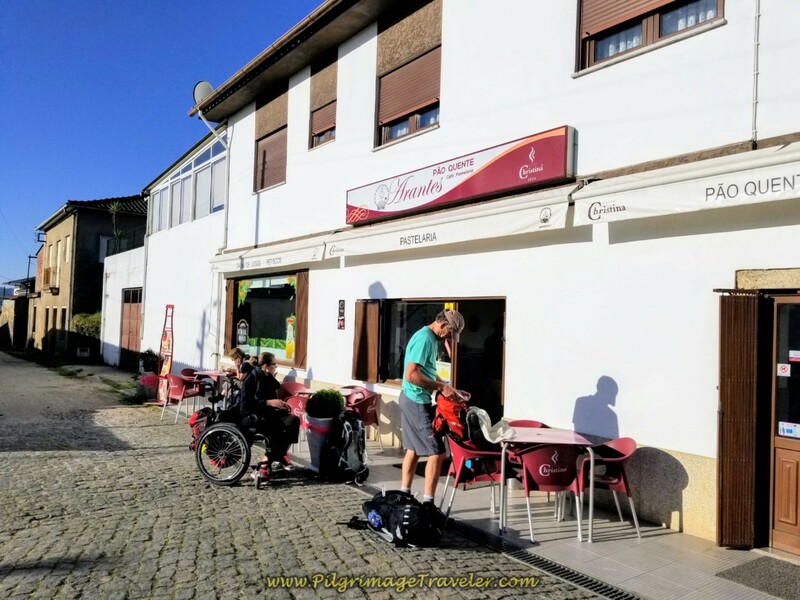 We all had our breakfast at the albergue, but we noted the Café Casa das Natas on the main street. It was not open. Most cafés do not open before 0800 in Portugal. Farther on, we walked by the glowing medieval tower on our right, with the sun capturing its glory, pictured below. And just across the plaza is the Church of the Good Lord Jesus of the Cross, also shown below. It is a lovely octagon-shaped building. 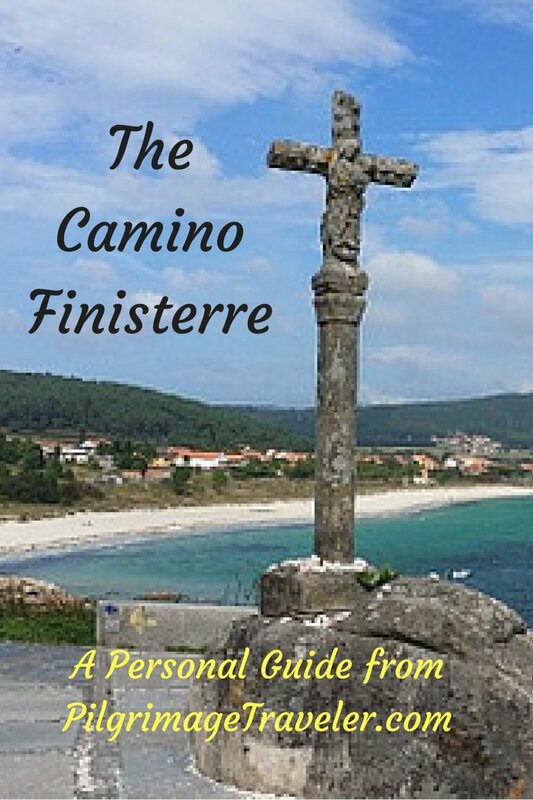 The Camino turns left by the church to pick up the Av. da Liberdade. We continued walking north through the city streets for not quite one kilometer, crossing the main city bypass on a bridge. Across this highway bridge, you will enter the next town of Vila Boa. The way is well way-marked, as you can see, below. 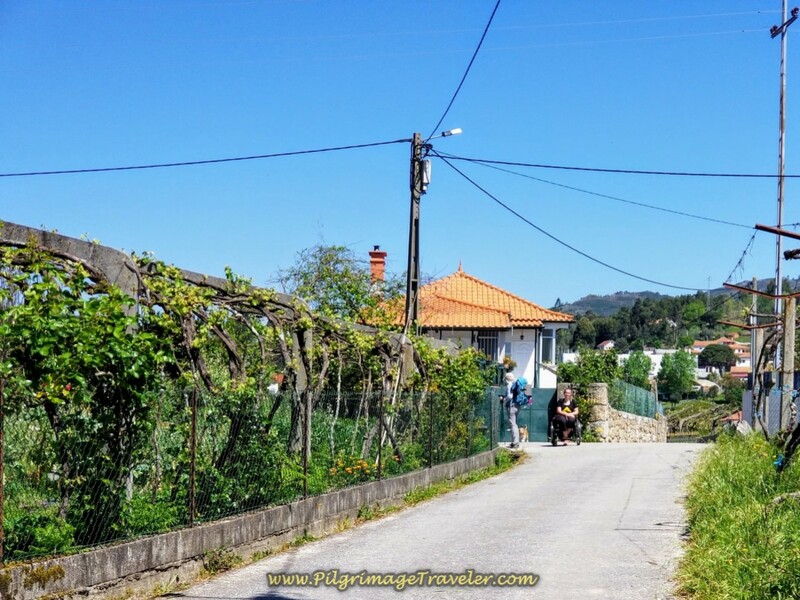 We continued walking north through Vila Boa and in less than one kilometer, we caught up to Magdalena, below. She was checking her route in her guidebook. She was happy to see us, and as usual we eased her fears, telling her just to come with us. We would get her through whatever we encountered. She agreed to join us once again. 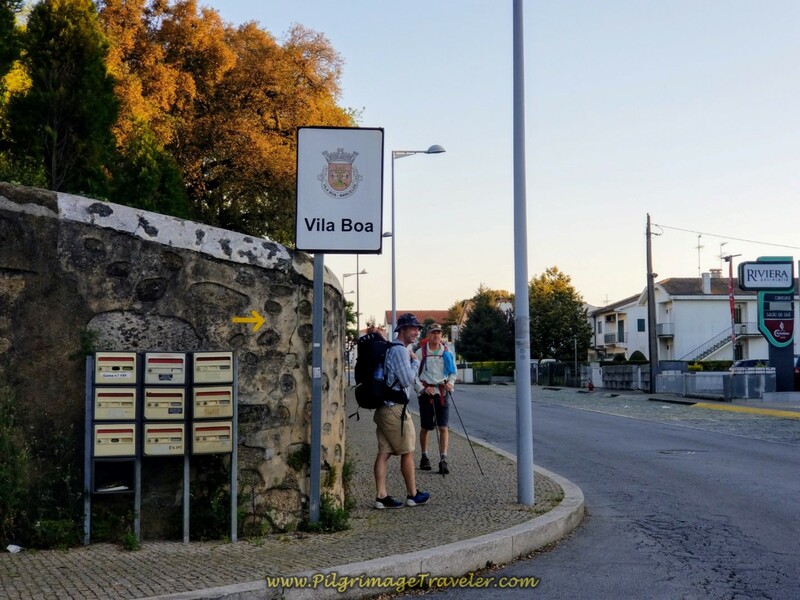 We continued northward, as the Way bended to the West, past the Café Central of Vila Boa. It was also closed. 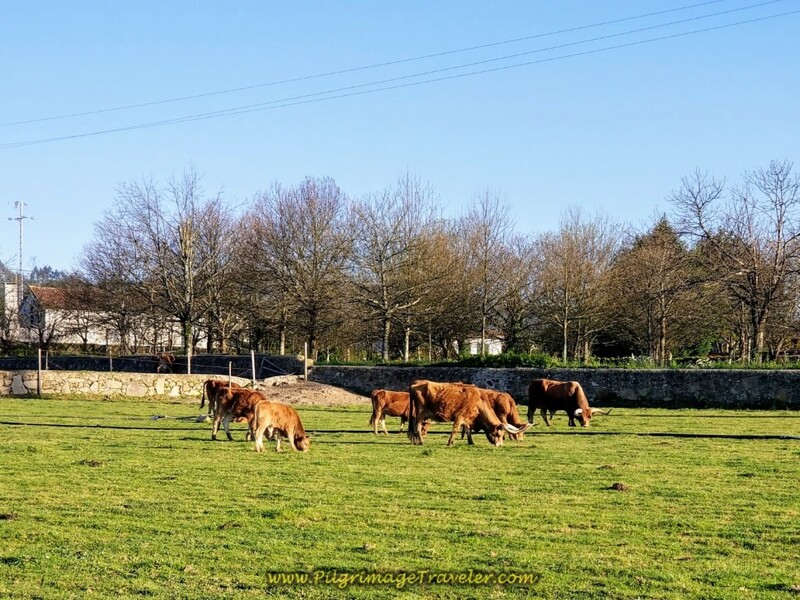 Here the area becomes more rural-looking and I was surprised to see a pasture of long-horned cattle, below. 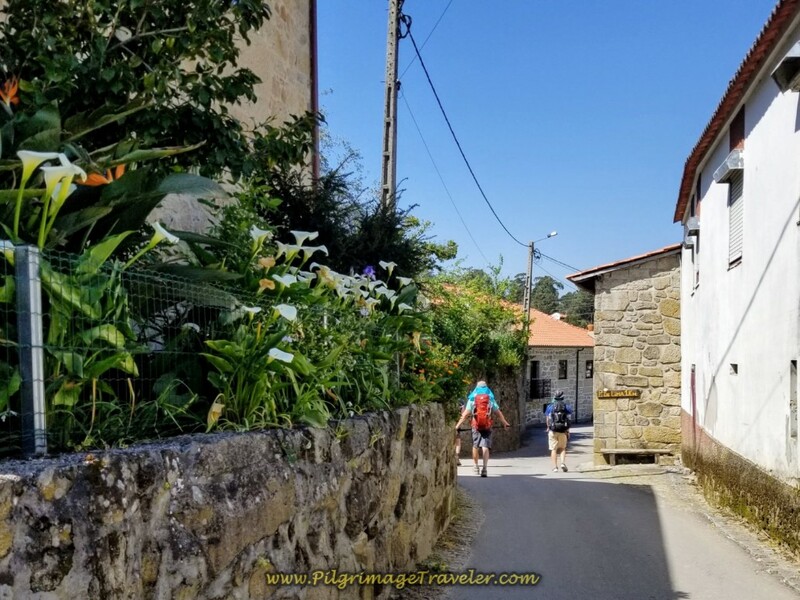 And then, when we came to this intersection, shown below, on the Rua do Espírito Santo, where the Camino turns to the right to begin another section off-pavement, Magdalena started wheeling herself onward toward the N204 instead. 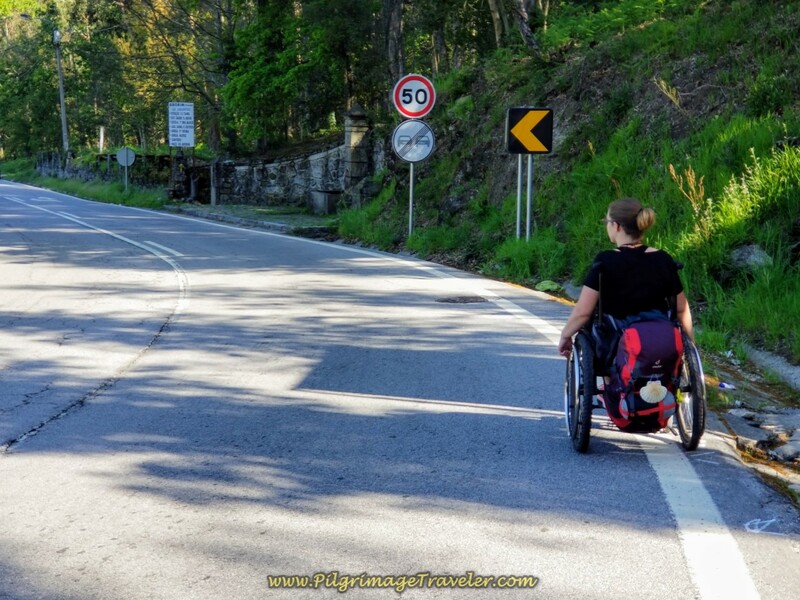 She had done her research the night before and decided she was going to take the highway from here, as the Camino would be too difficult for her going forward in a chair. I ran ahead to catch her to ask her what her plan was. As it turned out, the truth was that Magdalena did not want to inconvenience us, by making us push her as much as needed the day before! I slowly understood her dilemma, and said, "Why don't we ask the guys how they feel about it? She reluctantly agreed. The guys caught up, and we conferred as a team. They were more than willing to push her again. She slowly acquiesced. 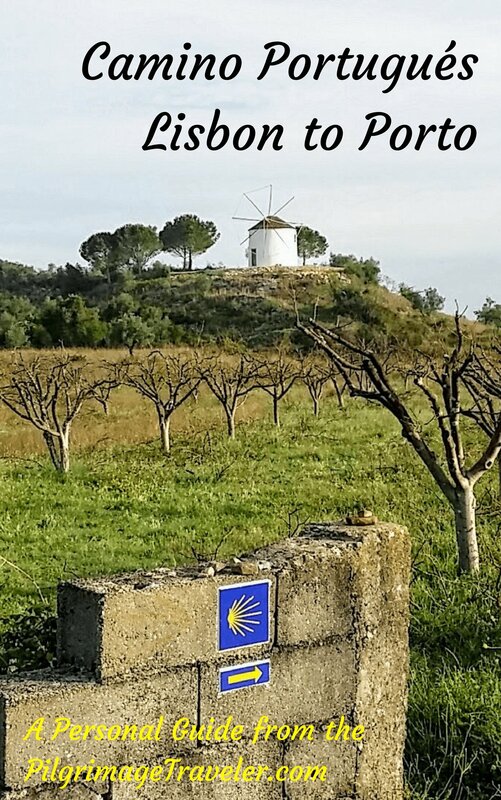 After all, the Camino is about being connected. Yet she was determined to be independent and do as much herself as possible. I understood her need for independence, of course, but I offered her the suggestion that accepting help may be her lesson as well? After all, we humans need one another, and we were all willing and able to have her continue on with us, together. 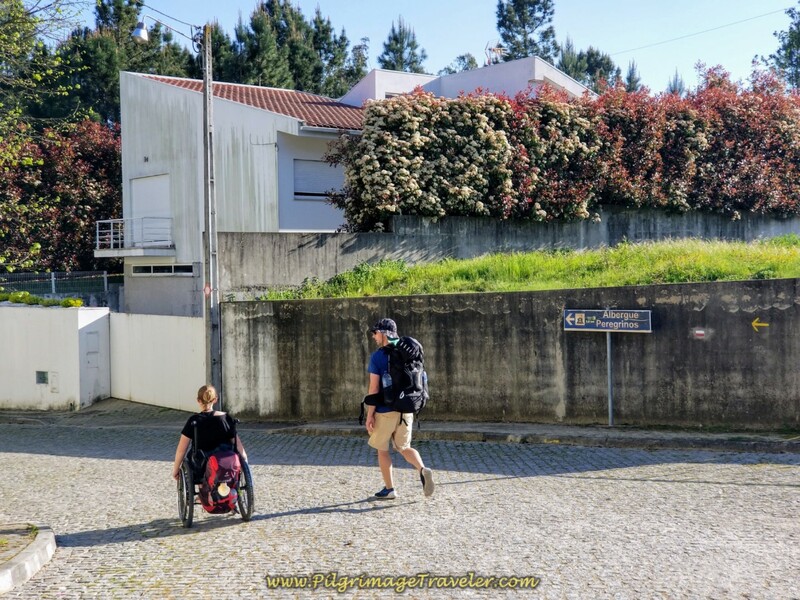 Here is Matt, with Rich in tow, taking the bull by the horns as he pushed her back to the turn off of the Rua do Espírito Santo! Onward, together we went! 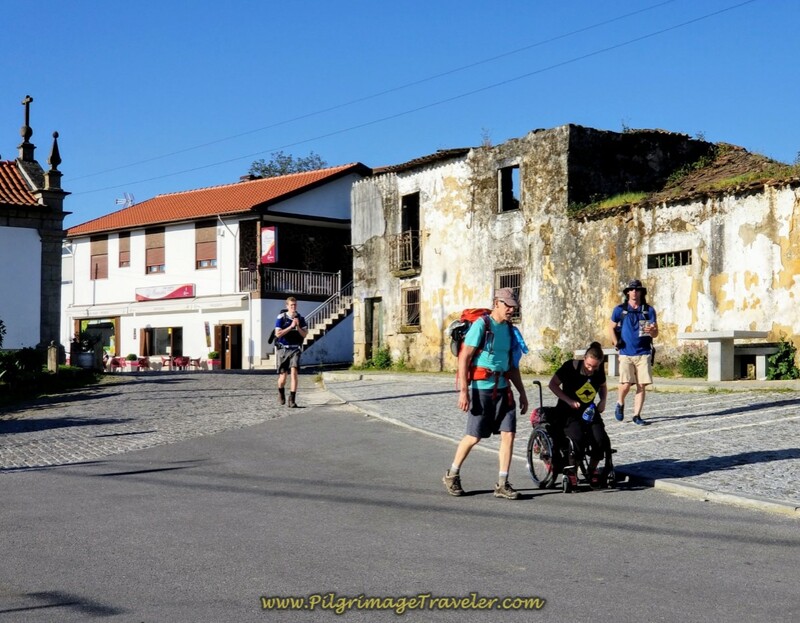 Magdalena easily wheeled herself along the Rua do Espírito Santo, past the Cruzeiro, below, on day seventeen of the Portuguese Way, Central Route. And then the terrain became more interesting. Here the cobblestone street becomes quite steep, as it drops to the train tracks below. Rich is helping Magdalena brake as she negotiated the steep terrain. If you notice in all the photos of her, she never just sits back and lets someone take total control. She is forward in her seat, hands on the wheels, with at least one foot down, ready to brake. This is how she gets the front of her legs all banged up and bruised, as they hit her chair legs in the front. This is also how she gets many blisters on her hands! After descending down to the train tracks, and crossing under them, the Way took us to this cobblestone and dirt lane, below. Matt is guiding Magdalena here, through this terrain. Along this rural lane, a farmer comes by on his tractor, waves to us, stops and gets off the tractor. He says, in English, "Where are you from?" to Magnus. Magnus says "Germany!" The farmer reaches to shake his hand, then when Magnus reaches out, he does the trick where he pulls his hand back and rubs his head. We all laughed. Then he asks the next person, 'Where are you from?" Again, just as the person reached out, he pulled his hand back, and did another type of wave with his hand. We all laugh again! 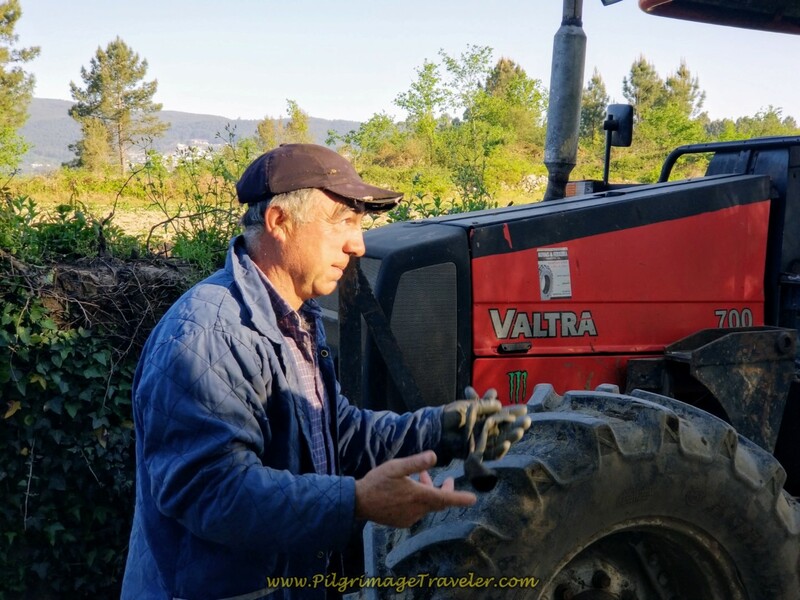 Then he wishes us a "Bom Caminho" and gets back on his tractor and drives off. We laughed about this friendly interaction for a while afterwards. I wondered how many pilgrims he accosts in a day or week, amusing himself in this diversion. What a character! More country charm was ahead on this lane toward the next town of Lijó. 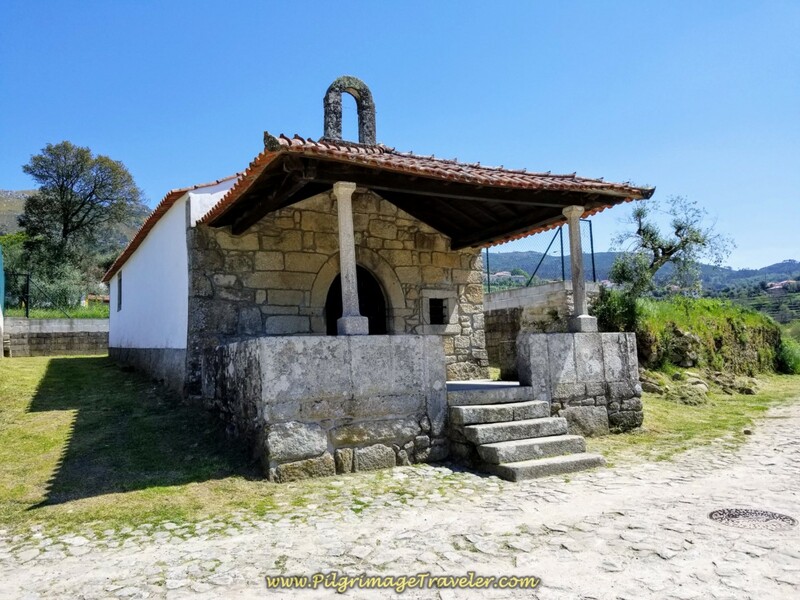 When we reached Lijó, after about one kilometer on the dirt lane, the lovely little Capela de São Sebastião greeted us. Across from the chapel is the Café Arantes, which we took the opportunity to have our first real cup of coffee with milk (café con leite). 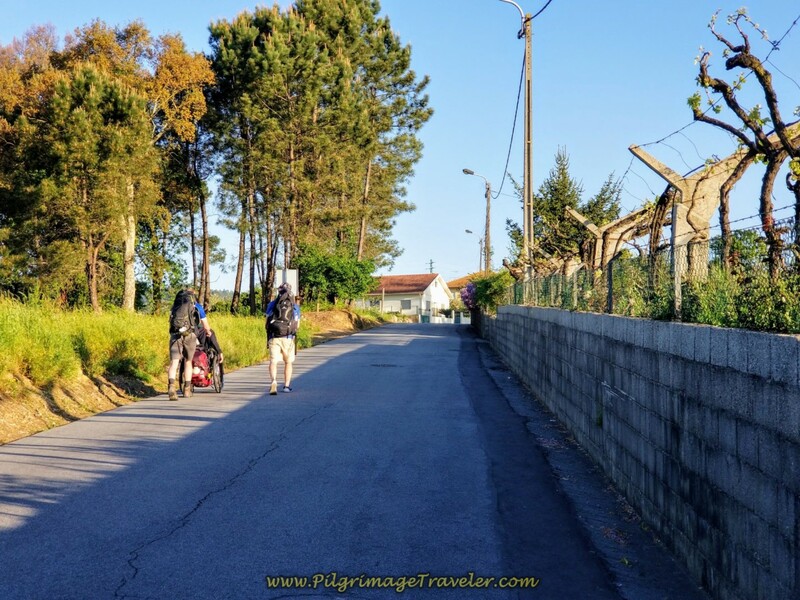 We had clocked about 5.0 kilometers into our day seventeen, Camino Portugués on the central route from Barcelos. Then, onward, we set off, Magnus, Rich, Matt and I. 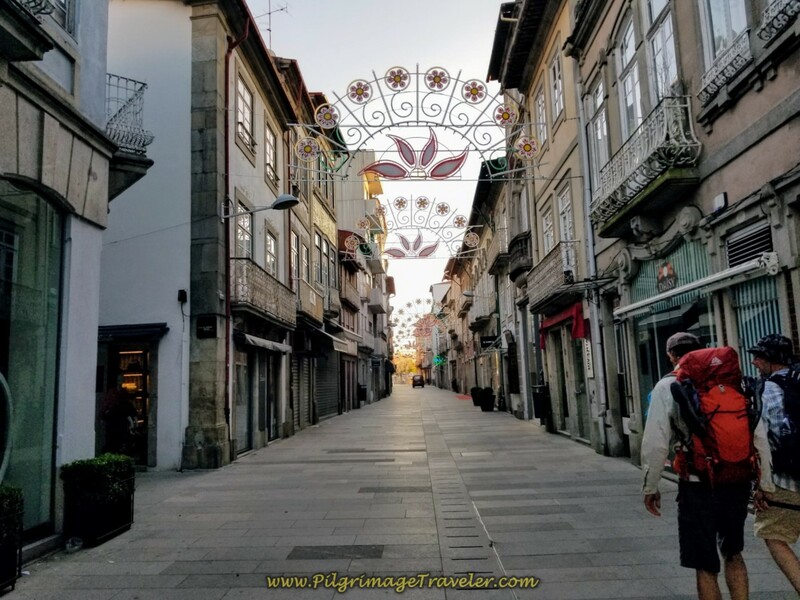 We were back on the pavement again, on the street called "Rua dos Caminheiros de Santiago" or "Street of Two Santiago Walkers!" Lovely name! 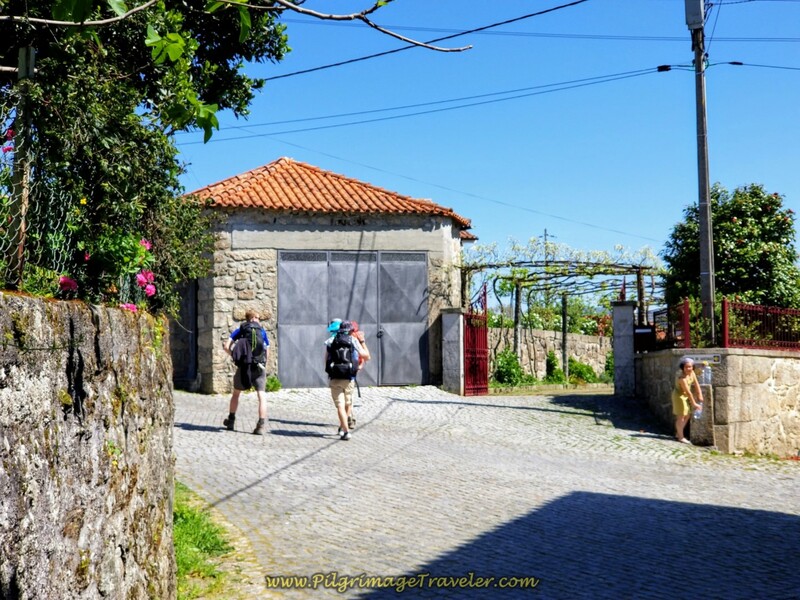 Just beyond the café and chapel, above, we saw the Casa São Sebastião guesthouse. Click on the link for their Facebook page. It looked inviting. 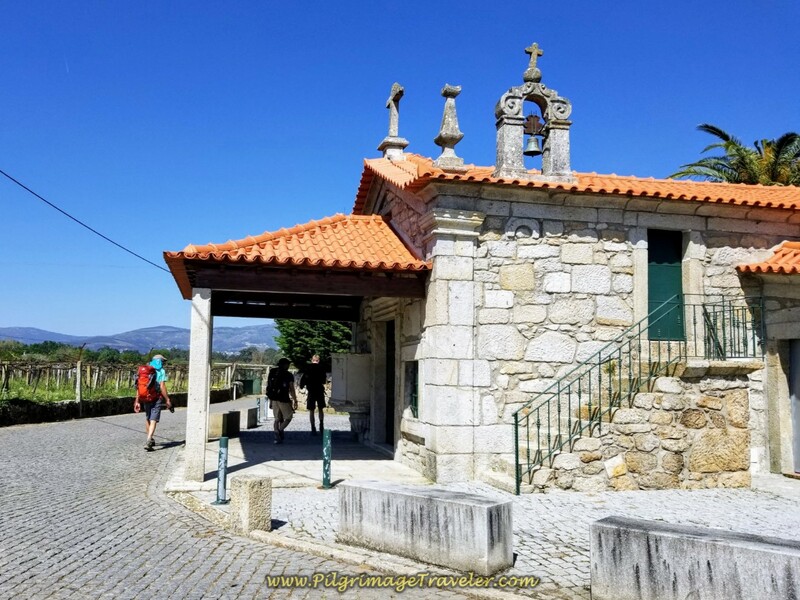 In a few hundred meters from the café was yet another gorgeous chapel, the Capela de Santa Cruz, shown below, on day seventeen of our Portuguese Camino along the Central Route. By the church there is a very nice information board, listing all the municipal albergues on the Central Route! Take a photo of this for future reference. 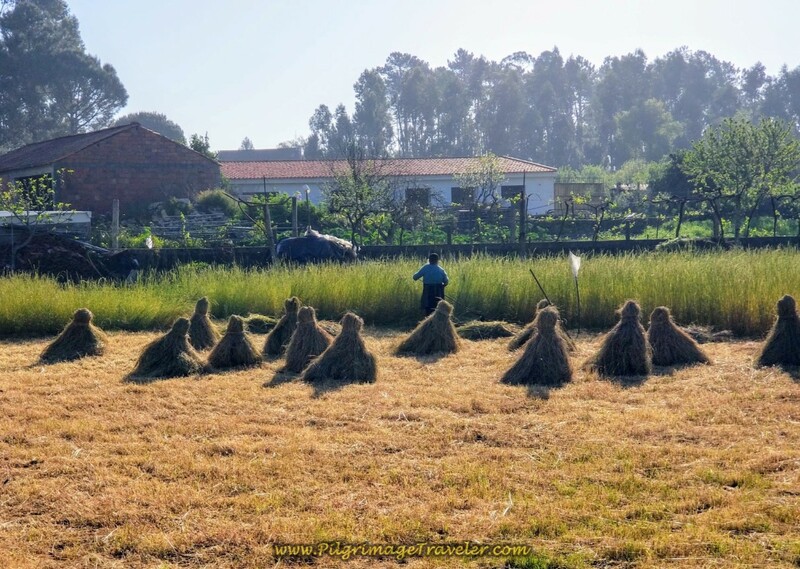 Continuing on our "Street of Two Santiago Walkers," we left the town and had a marvelous jaunt through the countryside, seeing more farmers, below, gathering their grass into hand-made sheaths. Fascinating, this "Old Country." 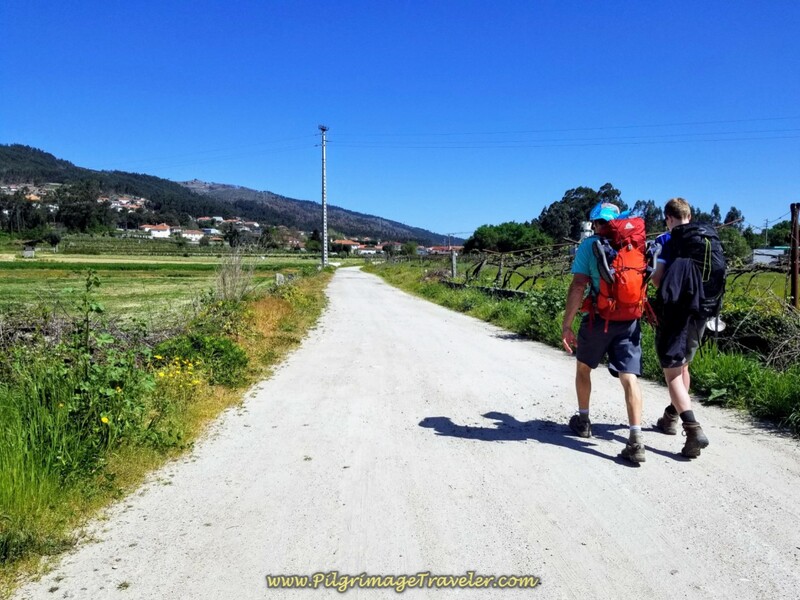 After about one kilometer, the countryside Rua dos Caminheiros de Santiago ended, and we crossed over the CM106, to follow the same road, now called the Caminho de Santo Tiago. Rather a version of the same thing. Here is Magnus pushing Magdalena across the street. 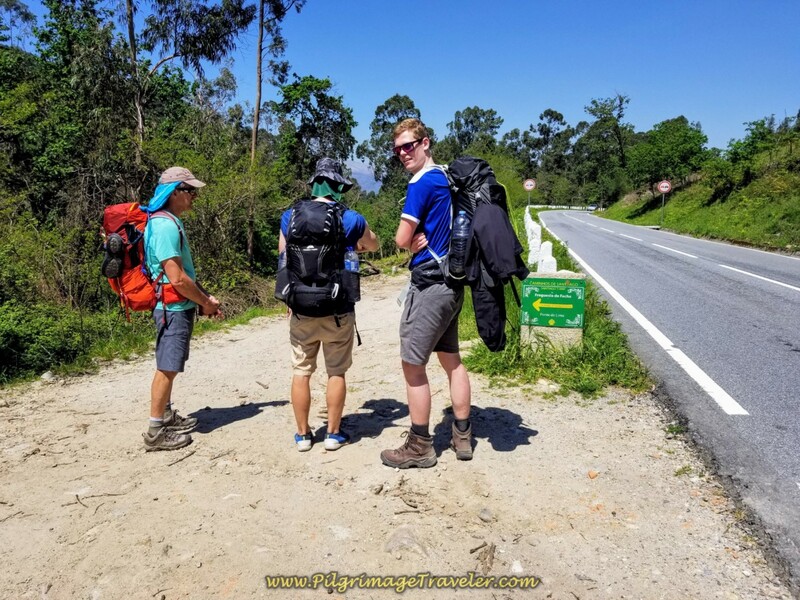 At this next crossroads, in less than another kilometer, we came to this signpost announcing that the next albergue was 2.0 kilometers away. That would be the one in São Pedro Fins. 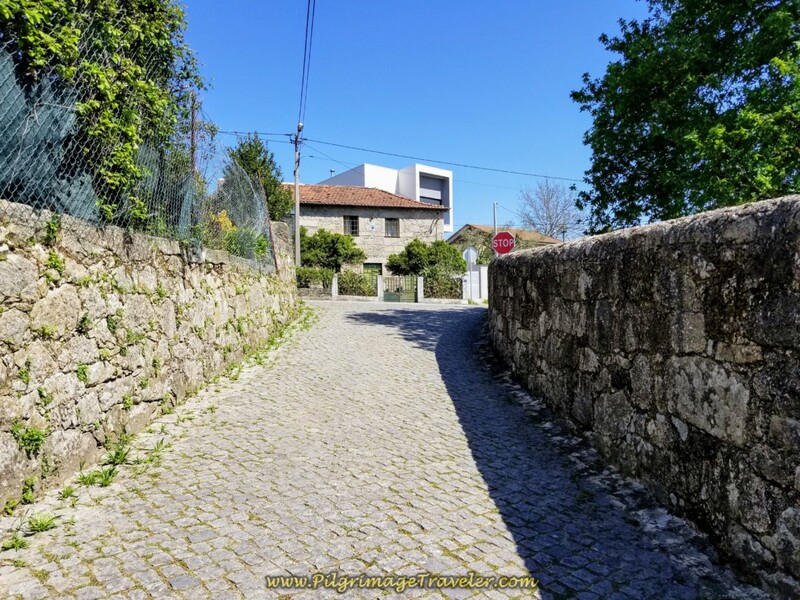 As we turned onto this cobblestone street, there is a sign informing us that we were arriving in Tamel, São Pedro Fins, the next town. Interesting that the sign is here, when the town is still kilometers away. 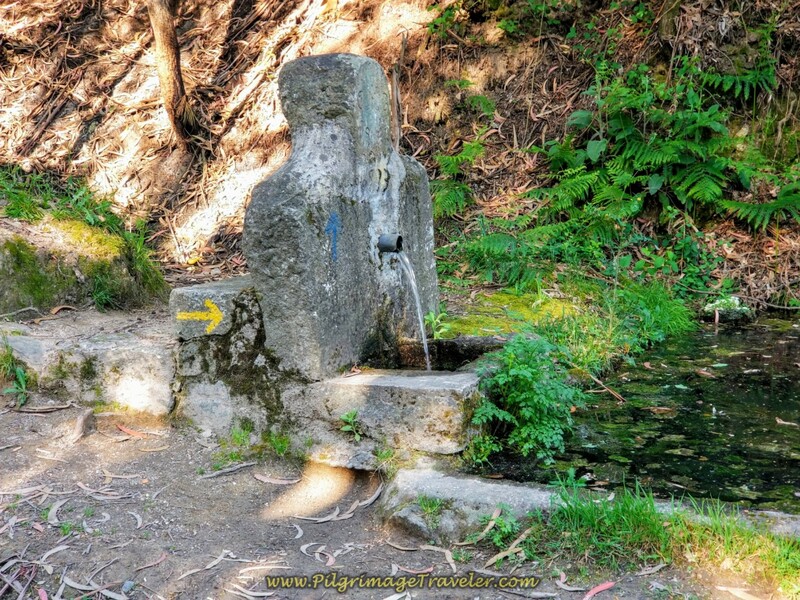 Within a few more steps, is the interesting Fonte de Ferreirinha. You can safely fill your water bottles here, if needed. And within 2.0 kilometers we arrived into the center of Tamel. Here the yellow arrow leads you up the stairs toward the church and the albergue, below. It was early in the day and there was no one in the albergue. Magdalena briefly considered staying here for the night, then quickly abandoned the idea when she realized she would be waiting in town for a long while before it opened. We decided as a group to carry on. The gentlemen explored the church to see if it was open (which it was not), while I sat on the terrace wall, enjoying the ambience of the place. It is a lovely spot on earth. If you are seeking serenity, this would be the place. After the albergue, we walked on and shortly turned right onto the busy N204. 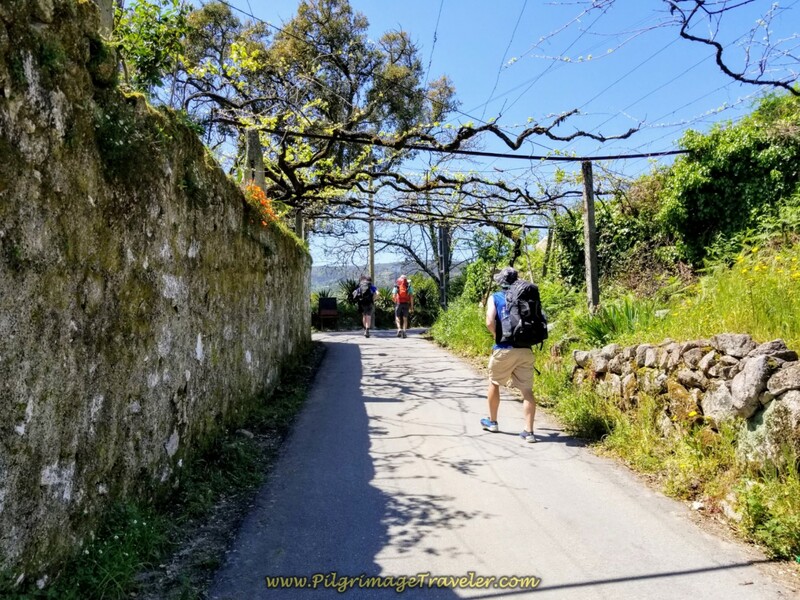 As you may notice, the Portuguese Camino on day seventeen of the central route, weaves back and forth with the N204, generally following in its path northward. We joined it for about 1/2 kilometer, before we reached another decision point for Magdalena. 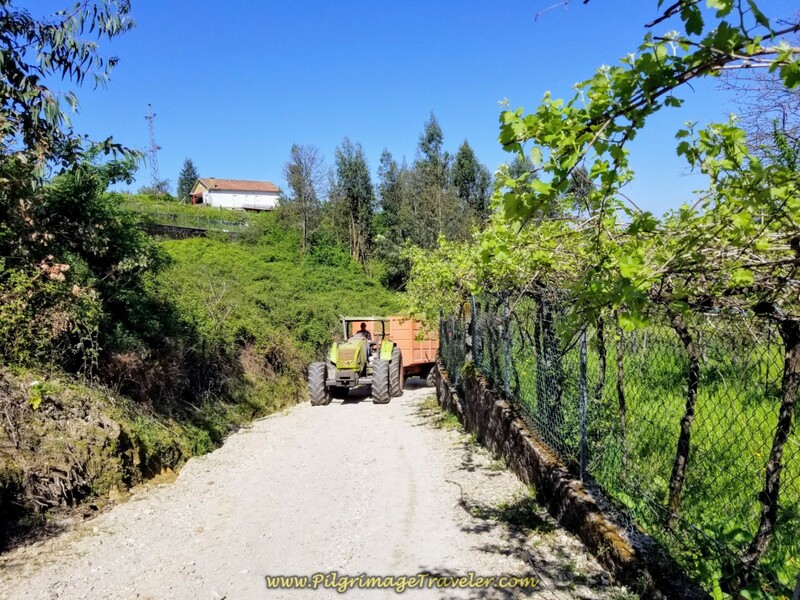 Magdalena wanted to continue onward on the N204 as far as she could go, and join up with us later, maybe even in Ponte de Lima. I felt horrible leaving her on the busy highway by herself. 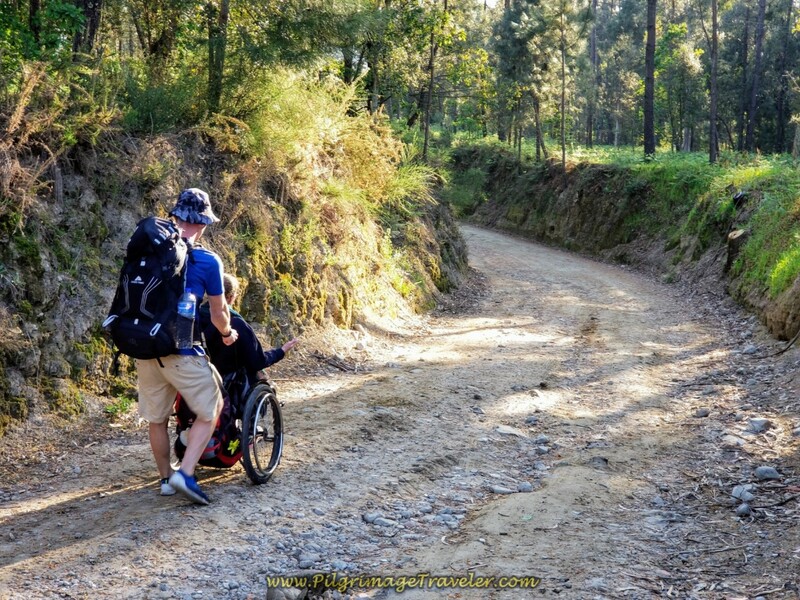 Indeed, the Camino ahead looked tricky for a wheelchair. She did not want us to have to push her so much. Plus, she wanted to make her own road, just like the quote above! What a courageous soul. She put me to shame. We reluctantly agreed to let her make her own road! I was so worried for her, and if she had been my own daughter I would have had a difficult time with this. But, alas, she was an adult and not my daughter! Then out of nowhere, Magnus said, "I have a reflective vest we could put on you!" What? Where did that come from? 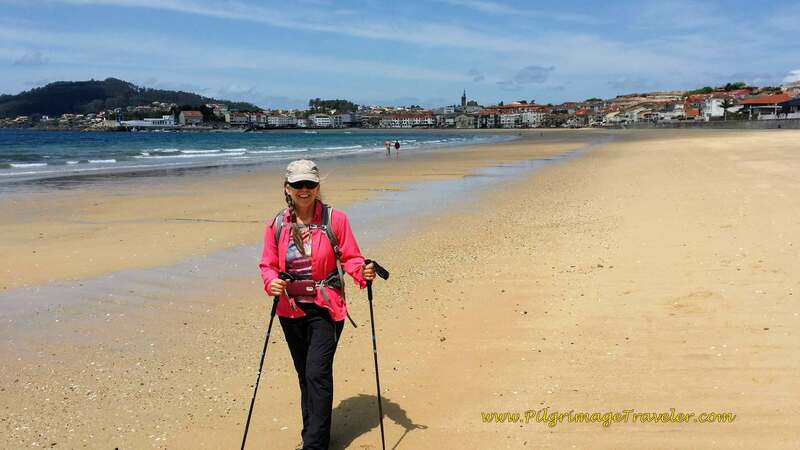 So amazing, that once again the Camino provided, most likely more for me and my peace of mind, rather than for Magdalena! She agreed to wear the orange vest, not on her person, but around her backpack behind her! She appeased us, yet kept her own independence. Clever girl! The photo below shows her just before she donned the vest as we tried to keep up to her free-wheeling down the highway! We had just crested the first high point of the day, and were heading down the hill on the N204 at the decision point. 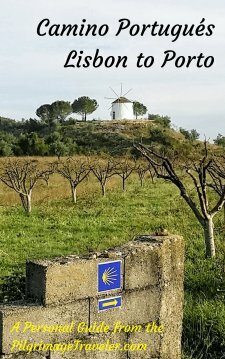 After our sorrowful farewell, we turned left, off the highway as directed by the waymarks, first onto the M549 and then right, turning onto side roads toward the next church. We all felt a hole in our hearts, because we were missing Magdalena, yet we did discuss the fact that we all felt relief that we would not have to assist her through the difficulties that lay ahead. It was a double-edged sword. The Igreja Nossa Senhora de Fátima is a modern church ~ a stark comparison to what we had previously encountered. The arrows directed us to walk to the east side of the church, shown below. From uphill on the ledge where the church stood, we could see the Tamel train station below, to the east. The guys were hungry. So was I. There was a café next to the train station below. I looked down and saw the goat track we would have to take to reach the café next to the train station. I didn't want to go, but I wanted to walk another several kilometers to the next café. The guys wanted to go. Argh! I didn't want to have to climb the hill back up to the church. I was pushed. I caved ~ three against one. We walked down the hill, crossed the tracks and went to the café. I was grateful for the food and for another cup of strong coffee with milk. We had clocked over 11 kilometers thus far, one-third of the day's walk. When we finished, I started off early, to get a head start on the hill back up to the church. 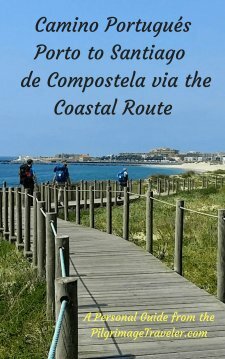 As it turned out, I could have just stayed on the road and re-joined the Camino farther north, but I didn't know. You can see the route if you zoom in our map above, at the train station in Tamel. Instead, I walked down the stairs from the church, shown below, and by its Cruzeiro. It was a joyful walk. I was happy to be back on the road. 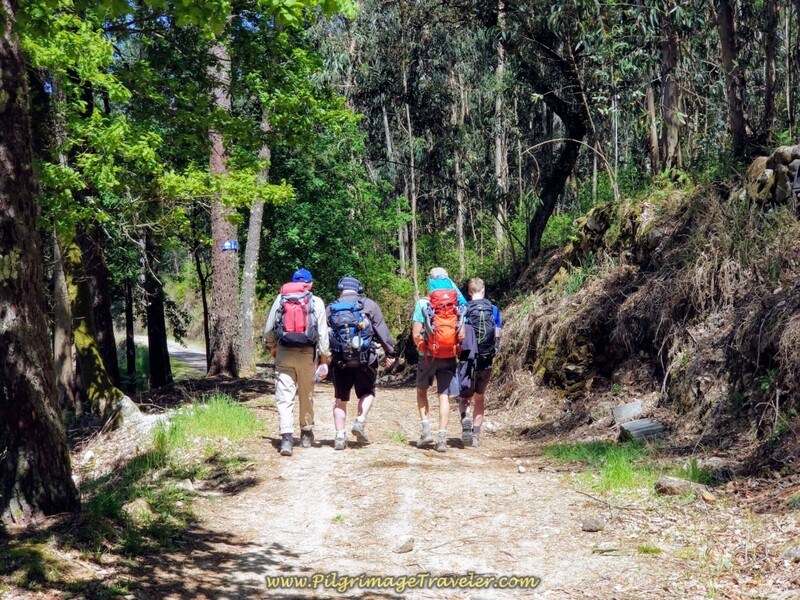 The guys saw me ahead and took a shortcut below the church to join the Camino. Together we rounded a bend, down and around, crossed the train tracks again, to pick up the Rua de São Tiago, below. Another variation of the name of the road to Santiago. 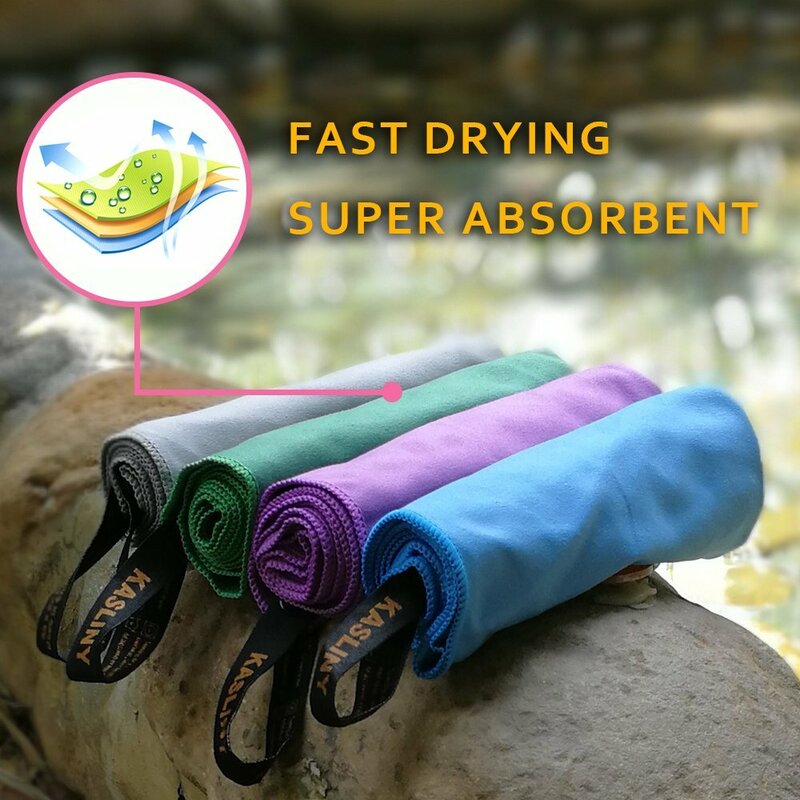 If felt official, because of the name! I wondered for how many years it was so! This country Way was beautiful once again. The Camino manages to stay west of the N204 for this section. My thoughts often turned to Magdalena, as I wondered how she was doing, breathing a prayer for her safety. I would have preferred to have her with us. She was so young and so brave, yet I couldn't stop myself from feeling how vulnerable she also was! I guess it was just the nurse in me! After about 1.5 km, this rural way ends near the Café Rosa (not shown). We joined the M549-1 to walk by Rosa's. 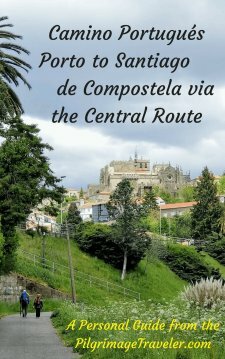 With full bellies, we walked on and picked up the street to the left, named the Caminho de Santiago, shown below. We were dropping in elevation towards the Rio Neiva and the Roman bridge, the Ponte Das Tábuas, shown below. Matt, Magnus and Rich obliged me to take their photo on the bridge. 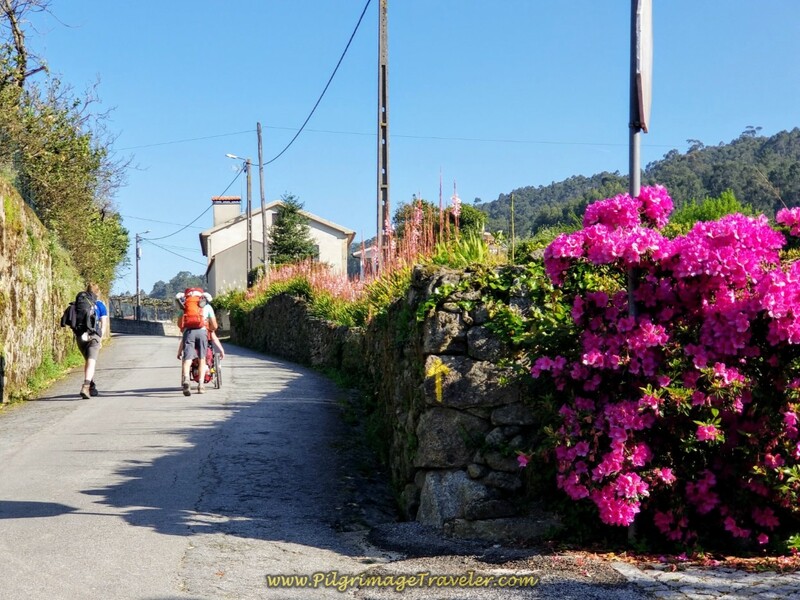 The road onward to the next town of Balugães was open and warm! 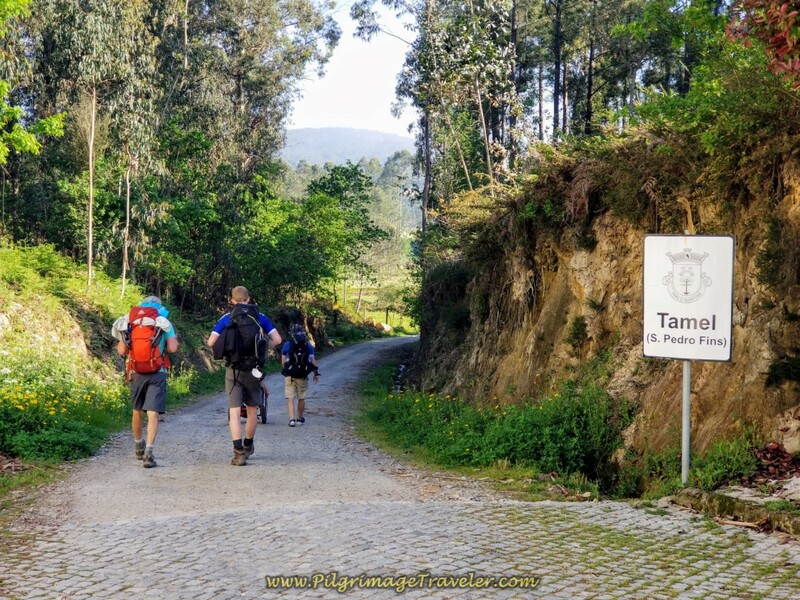 Entering Balugães, we encountered a sign letting us know that it was 18 Km to the next albergue in Ponte de Lima. 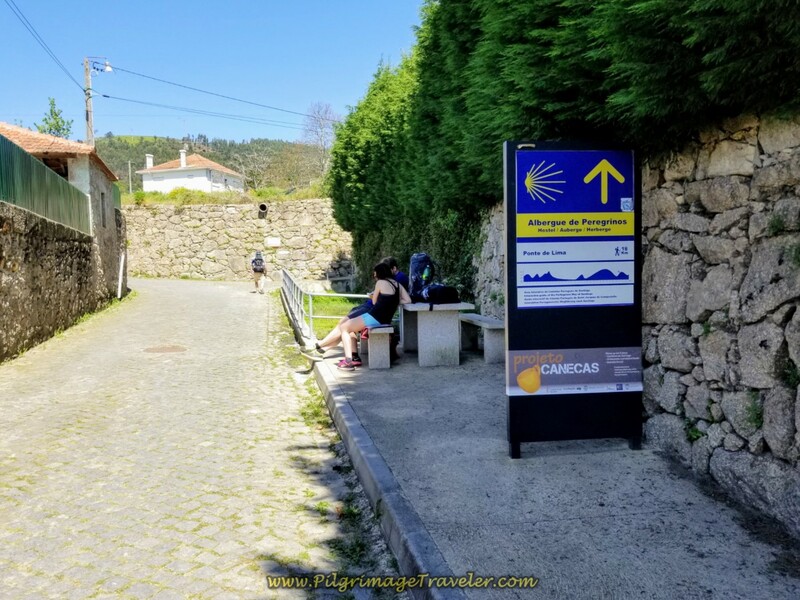 Just around the corner to the east of this sign is the Casas da Quinta da Cancela if your day ends here, almost 17 kilometers from Barcelos. Two pilgrims were lounging in the shade at the picnic table by the sign. Ahead, after the high wall shown below, we crossed the N308. A few meters later, we noted the kilometer countdown waymark! 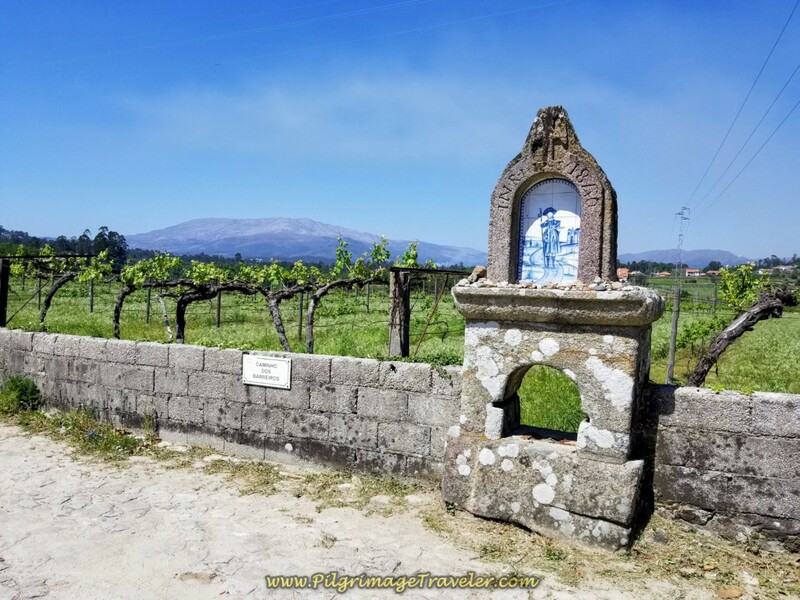 We wound around and through the town of Balugães and past this fountain, below, where you can see a local filling a bottle. 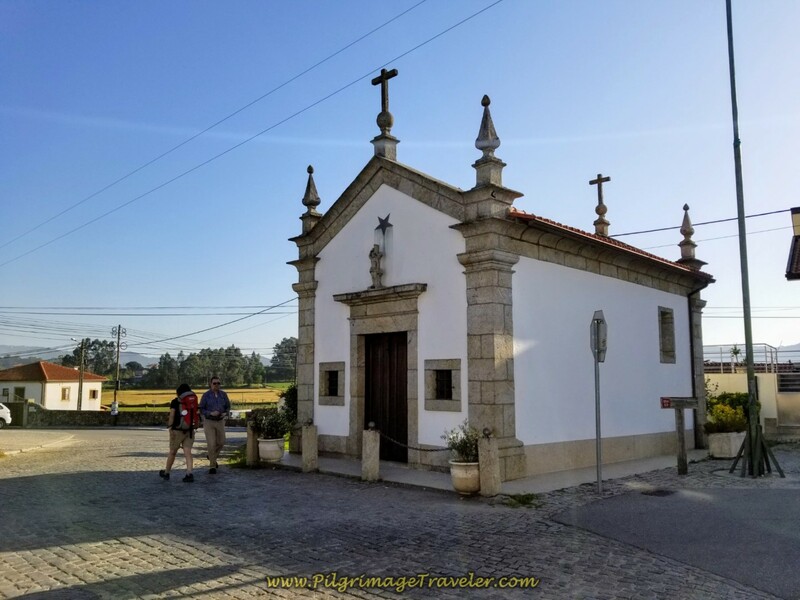 On the north side of town, on day seventeen, the Portuguese Camino central route, leads you by this very old chapel, the Igreja de São Martinho de Balugães, shown below. The way toward the next town here, is punctuated with some some welcome trees and shade. 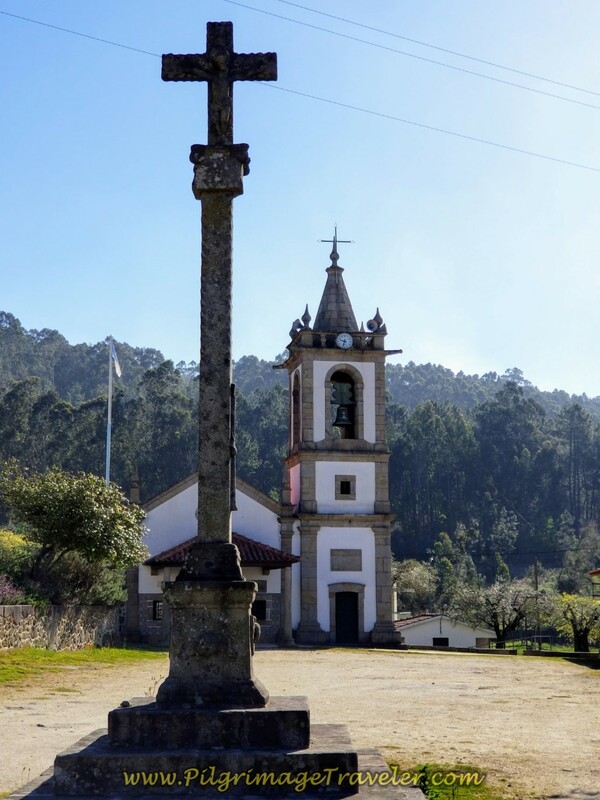 Then we reached the N204 once again from the west, and crossed here at this Capela São Sebastião. I smiled at the gaggle of local men hanging out at the crossroads. If I only knew what they were discussing. 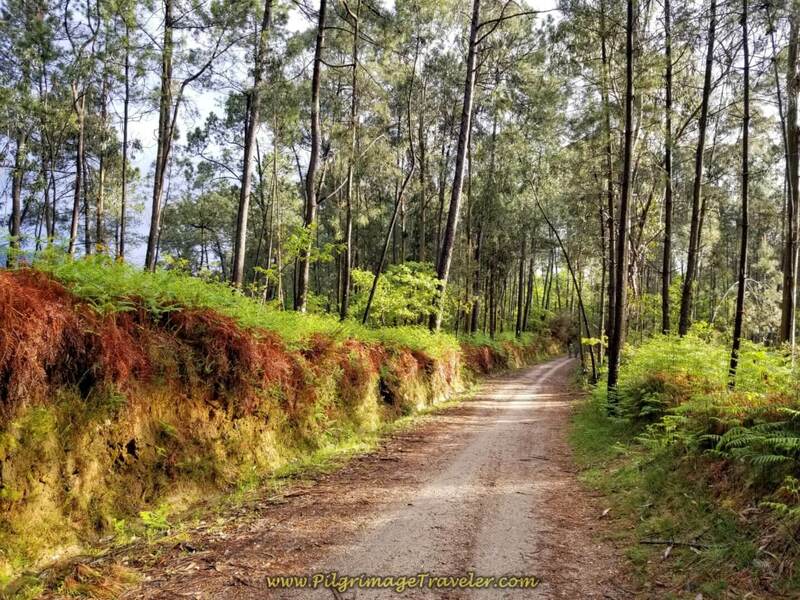 We continued to meander through the countryside on the way to Lugar do Corgo. Walking uphill, two puppies ahead grabbed my attention. As I followed their jaunt up the hill, there at the top, who do I see? Magdalena! At top of this hill is the famous Casa de Fernanda on the left, and Magdalena was waiting here. She had beaten us to this albergue. Magdalena did not know what to do at this point. 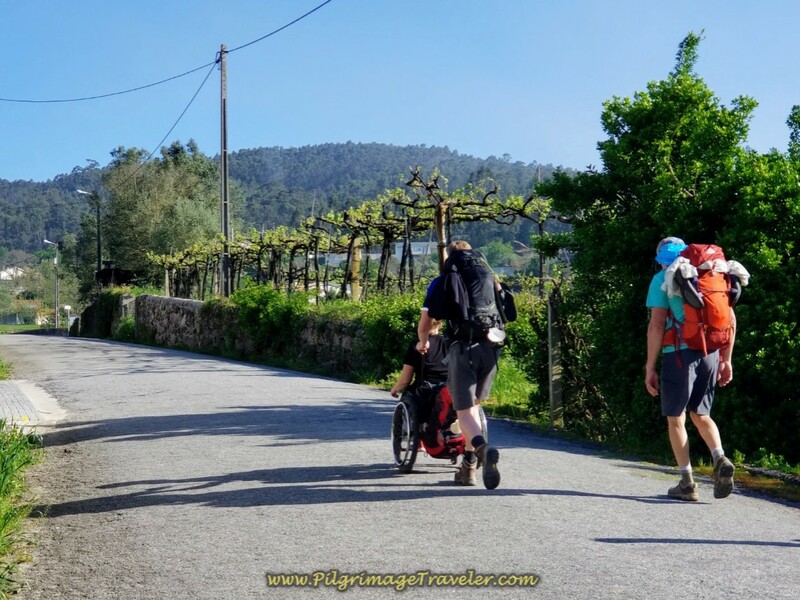 She had done well, rolling down the N204, but said she had trouble finding the Camino and the Casa Fernanda, and was wheeling around for about an hour, trying to find it! Poor thing! 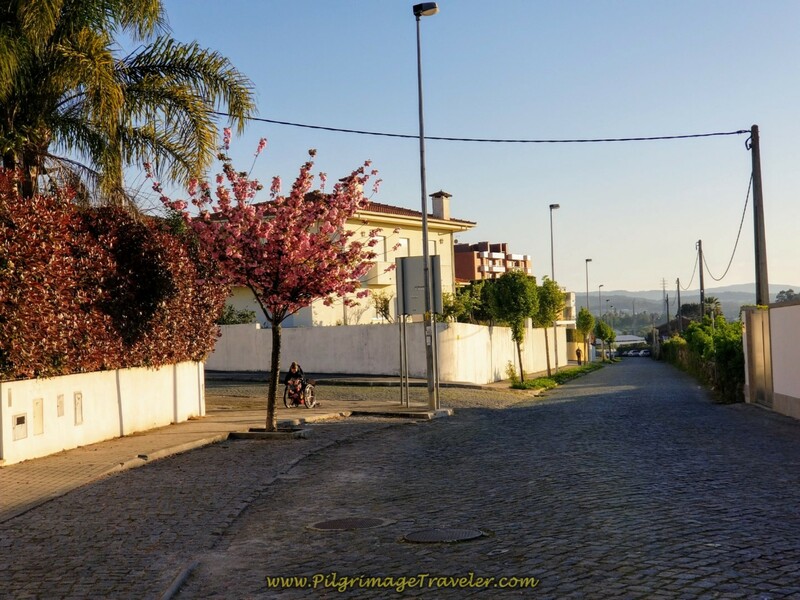 Magdalena was now frustrated and very tired-looking and hoping to catch a bus to Ponte de Lima. She did not know how to do this, and I realized we must ask a local. It was quite hot outside and we hung around with her, trying to figure it all out. She could not go forward with us - it was a long uphill from here through more difficult terrain. None of the guys were encouraging her to carry on with us. It would have been too much for all of us. Then suddenly, out of nowhere came Fernanda, the proprietress of the Casa Fernanda, to save the day! When we asked her about the bus, she confirmed the bus came almost right in front of her house. 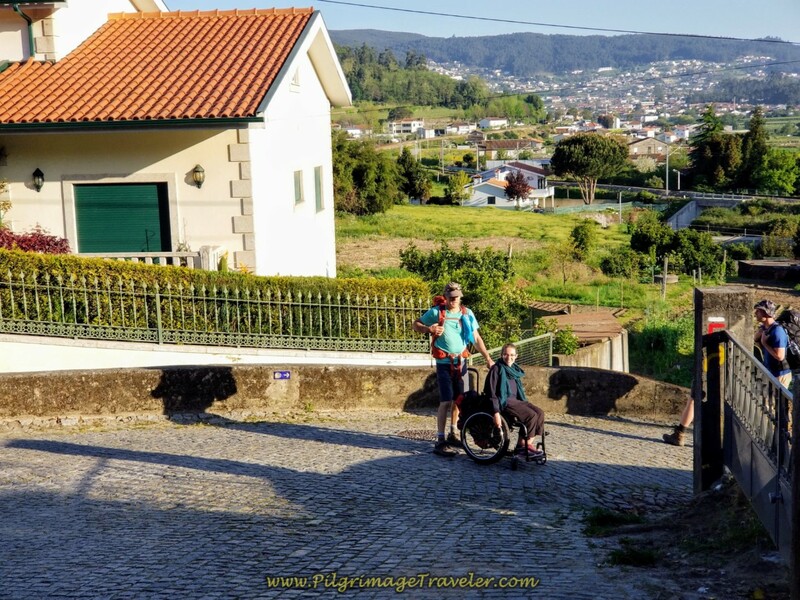 When she learned that Magdalena wanted to stay with our group, by going forward on the bus to Ponte de Lima, she said, "Why don't you wait here with me at my house? I'll take care of you, see that you get on the bus, and you can join your friends in Ponte de Lima!" I was so relieved to hear her words, I almost kissed her. I knew instantly that with Fernanda, all would be well. We could continue onward on foot, and Magdalena could still be with us this evening. It was a plan. I hugged Fernanda. 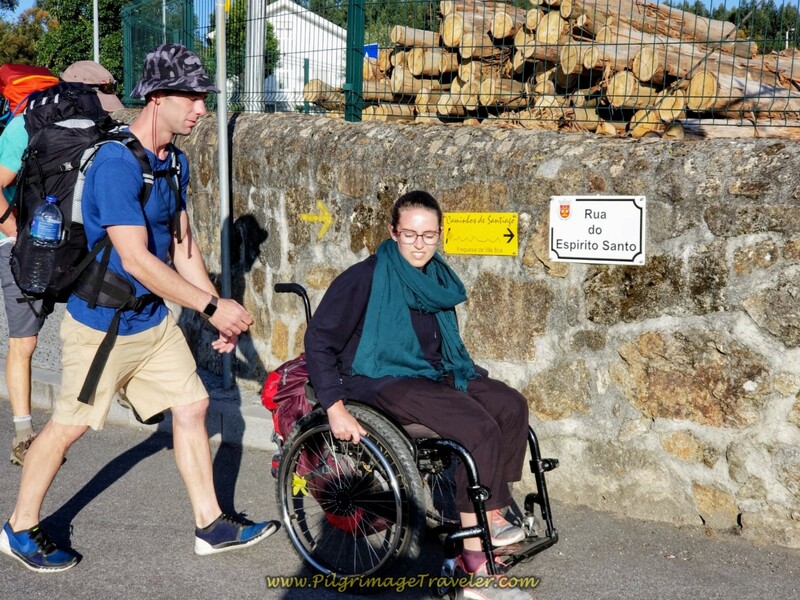 As we were setting off to leave, dear Fernanda said to us, "The Camino is about Love, and Santiago will give you all a special blessing for taking care of Magdalena!" I got goosebumps, realizing that we had just received a special pilgrim's blessing from Fernanda! As we walked on, I shared this realization with the three men. They nodded their heads, also in realization. We walked on in silence for some time afterward, absorbing what had just happened. 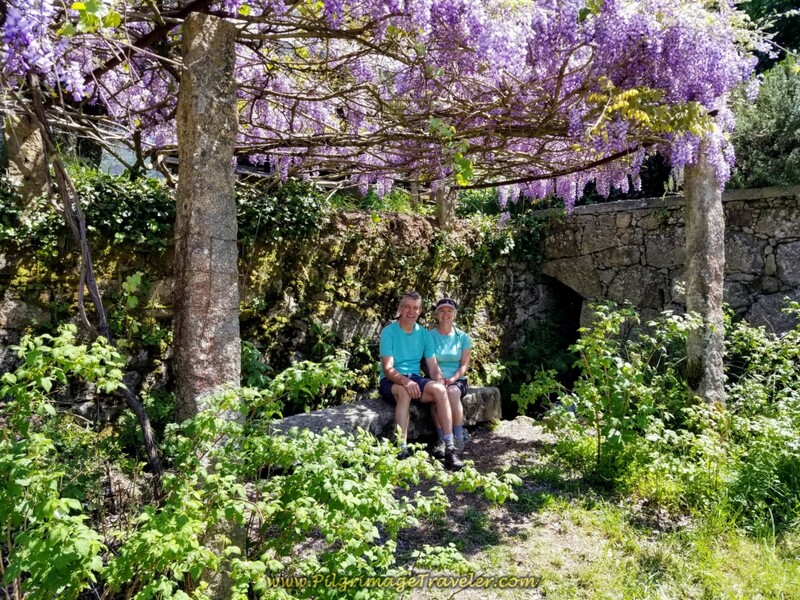 It was a very special moment for us on the Camino. 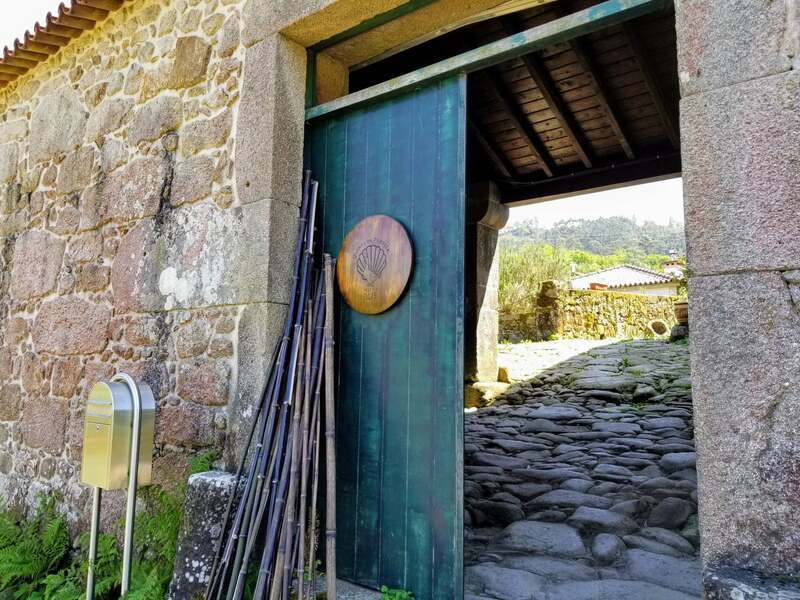 By the time you reach the Casa Fernanda you have logged about 20 kilometers into your day seventeen on the central route of Portuguese Way, not quite 2/3 of the day's walk. 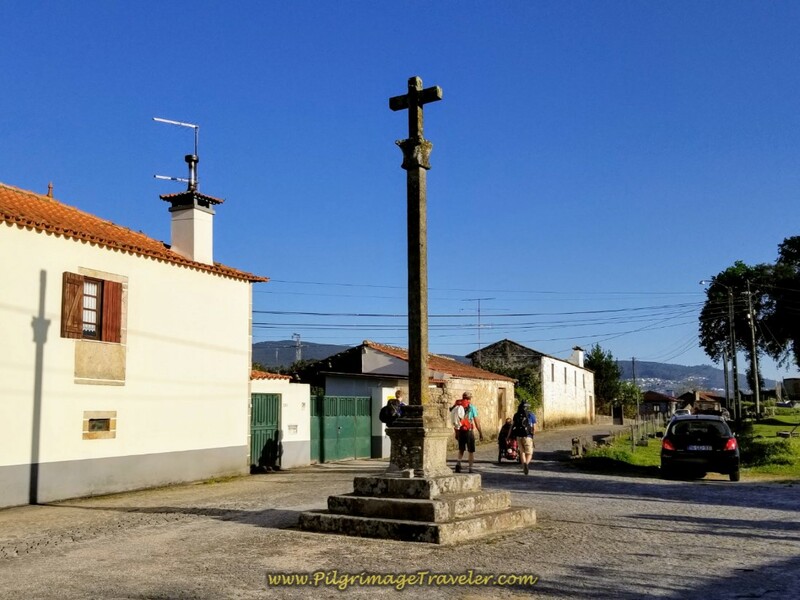 After the Casa Fernanda, the Camino turns through the vineyards, and climbs up to the second alto, or high point, through beautiful countryside as you will see below. 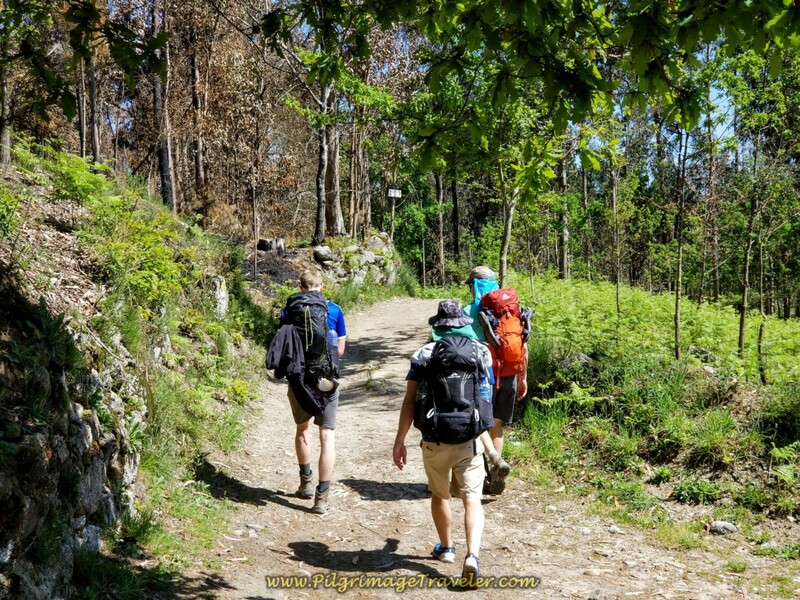 We set off, the three guys and I on easy pavement, followed by dirt road, starting to gain in elevation as we walked toward the next town of Vitorino de Piães. 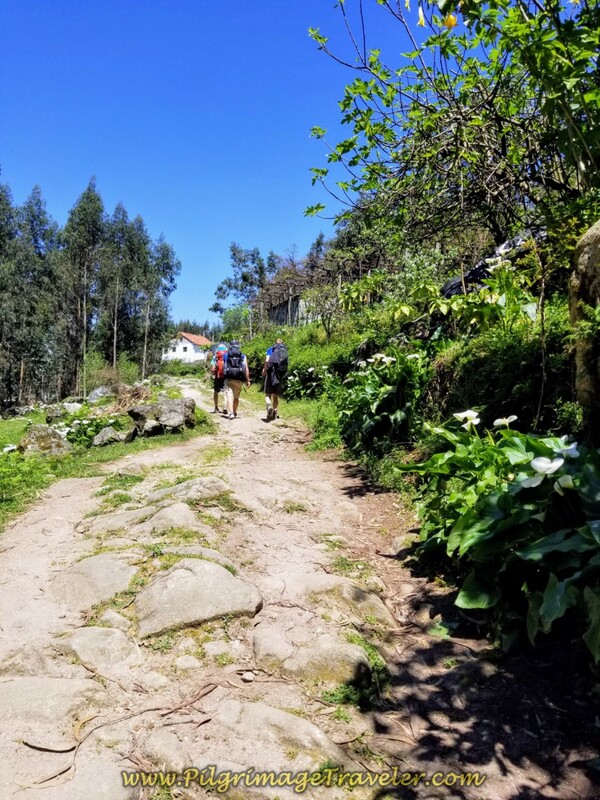 Along the way, there are two more establishments to spend the night, the Estabulo de Valinhas and the Casa na Quinta de Valinhas. Consult the map to find their location if you need. 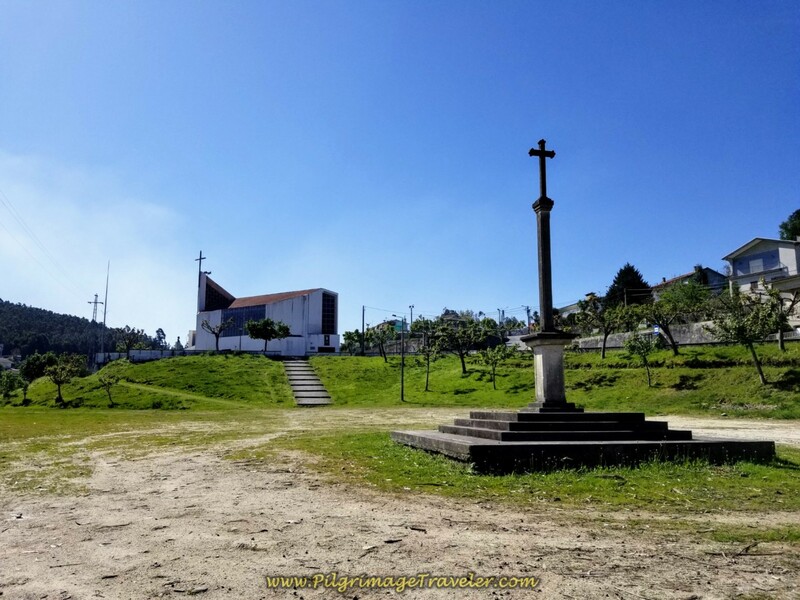 After about 2.0 kilometers from the Casa Fernanda, as we walked through Vitorino de Piães, the cruzeiro below appeared, in front of the Igreja de Vitorino de Piães. 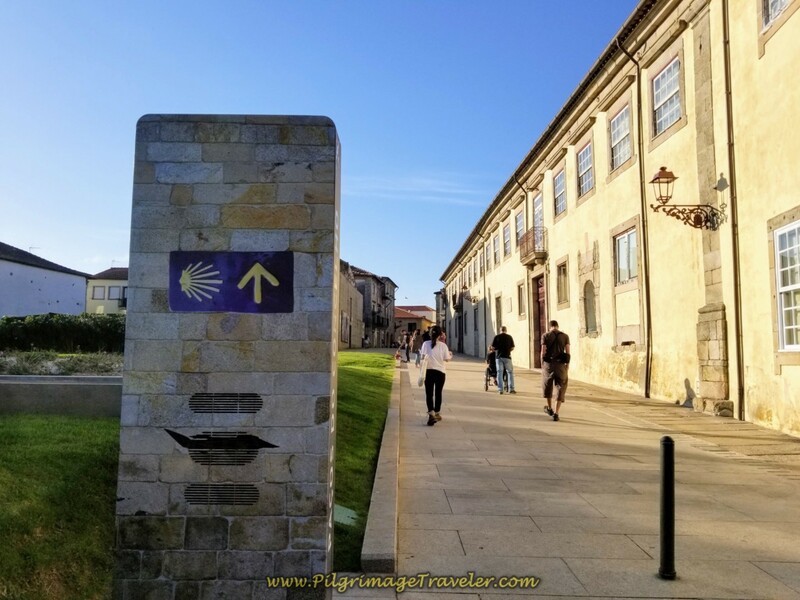 The Camino turns right here to walk towards and around the church. 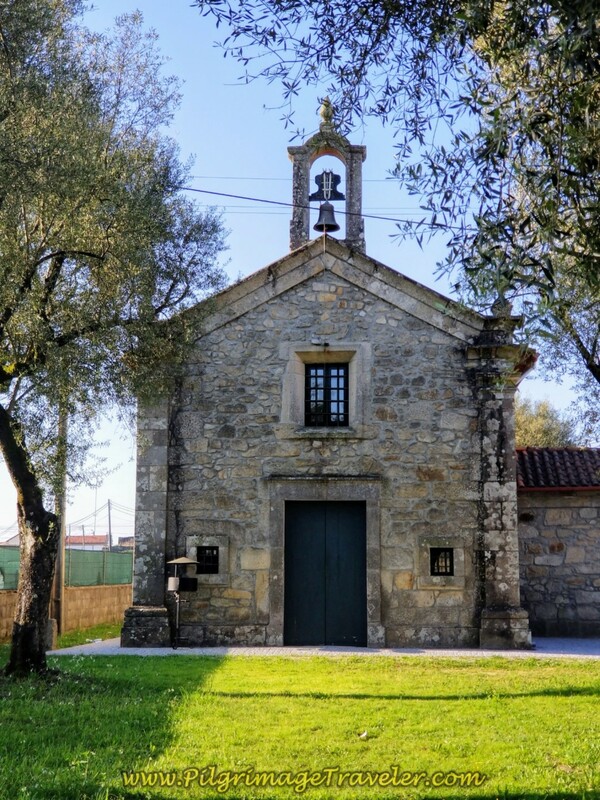 Just beyond this church is the Café e Restaurante Viana. It is the last café for about 7.0 more kilometers. 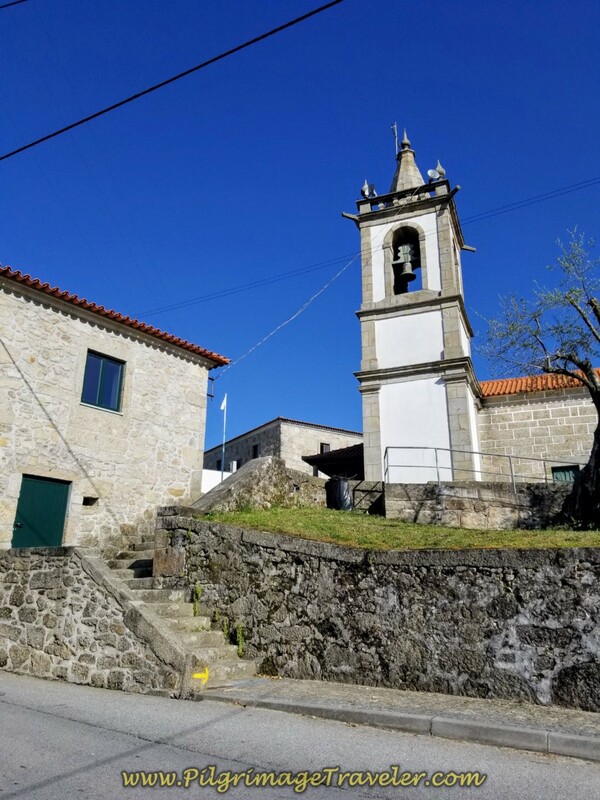 In one kilometer after the church in Vitorino de Piães, the road ends by a guesthouse called the Moradia Ponte de Lima. 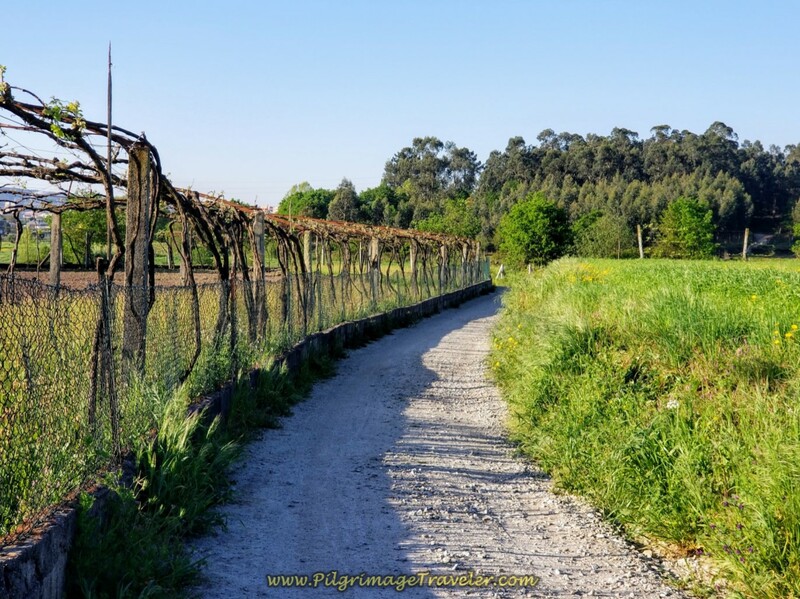 The Camino turns left here and onto a short section of ancient road, shown below. The road climbs as it follows a stream that is lined with Calla lilies. I wished this wonderful historic section would have been longer! 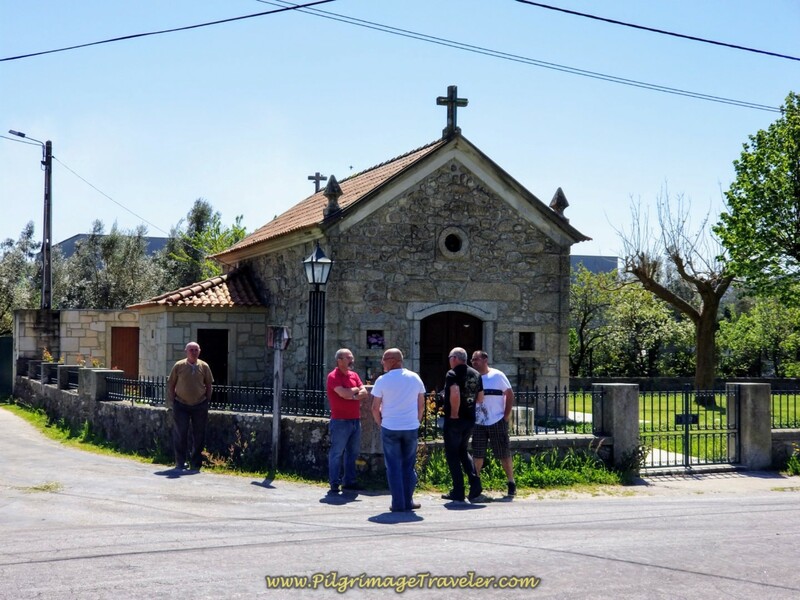 Then it is back onto the N204 again for a few steps, where we passed by the sign letting us know we had just entered the municipality of Facha. From here, the municipality was giving us a kilometer countdown to Ponte de Lima. It is also about here, that the final and second high point of the day is reached. 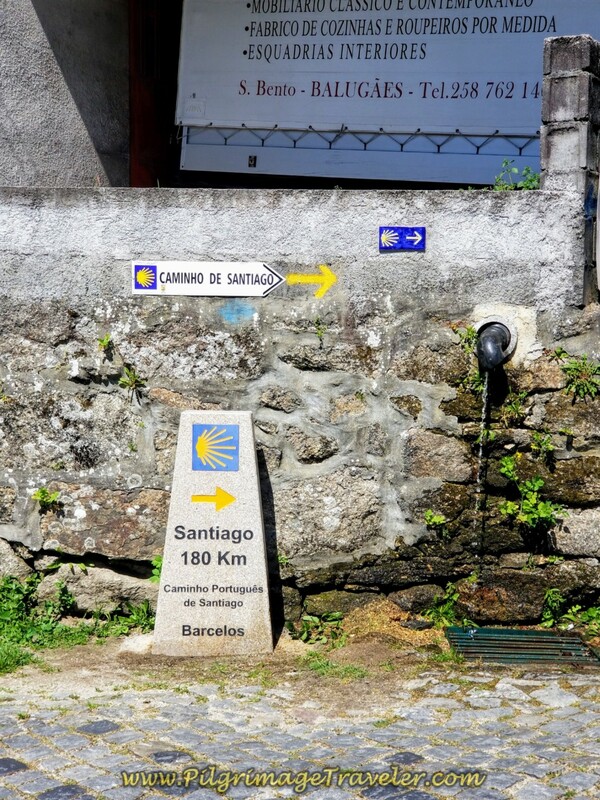 Just after the welcome to Facha sign on the N204, the Camino turns westward at this sign, below onto a dirt road. It is all downhill from here! We passed by two slower-moving pilgrims from England as we cruised down the hill through the forest. We chatted a bit. I was beginning to tire at about 25 kilometers into the day. 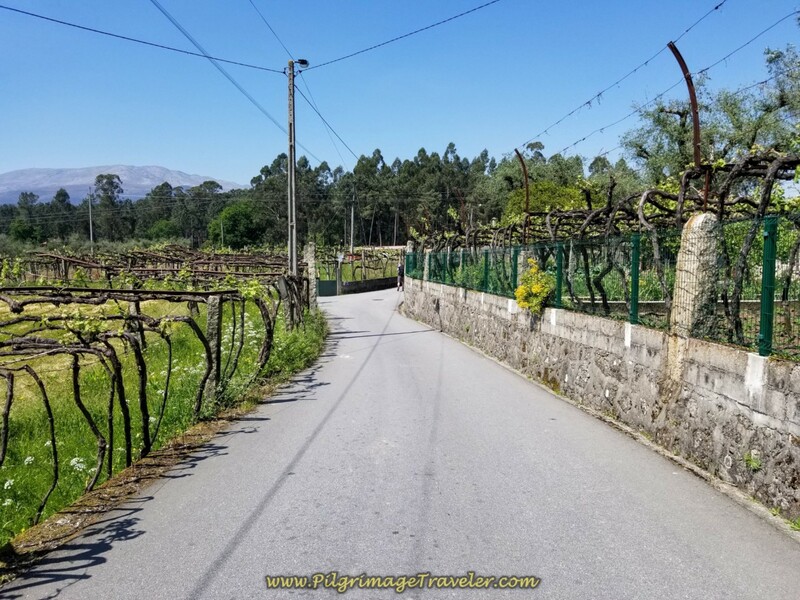 The road continues downhill, and bends to the right, when we see the inviting open door of the Quinta da Portela Facha, below. It is a beautiful place. Just beyond the door, by the road is an arbor with wisteria vines. It looked so inviting. I told the guys that if I were to keep going, then I needed a break! According to the signage we had 10.6 more kilometers to Ponte de Lima from here. We sat under the arbor, pictured below, next to a babbling irrigation canal and had refreshing oranges from our pack, cheese and chocolate! Perfect food to revive my spirits. I texted Magdalena from here. She hadn't yet gotten on the bus. 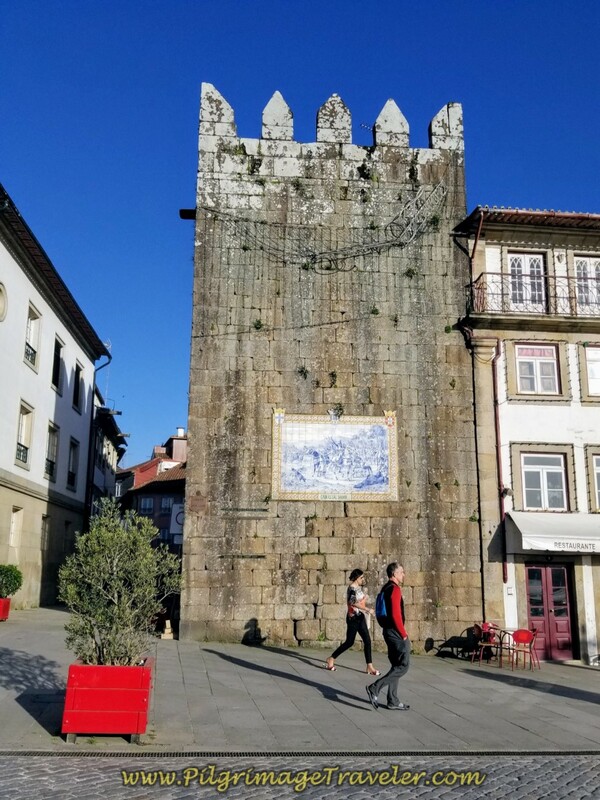 She still had a chance to beat us to Ponte de Lima. 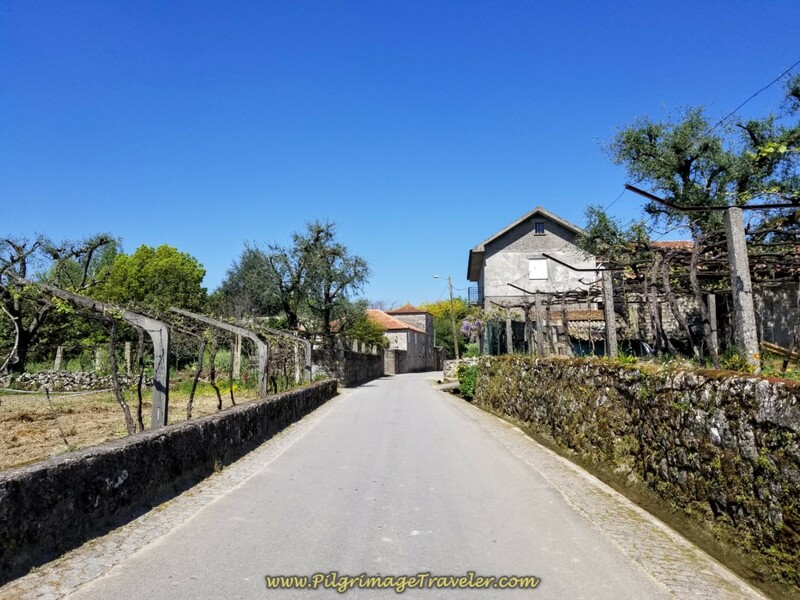 There is another quinta where you can stay for the night, just beyond the Portela, called the Quinta de Albergaria. I was reluctant to leave this fabulous spot, but got up, revived and ready to hit the road again. We joined the pavement of the EM1259, up a slight hill, shown below. 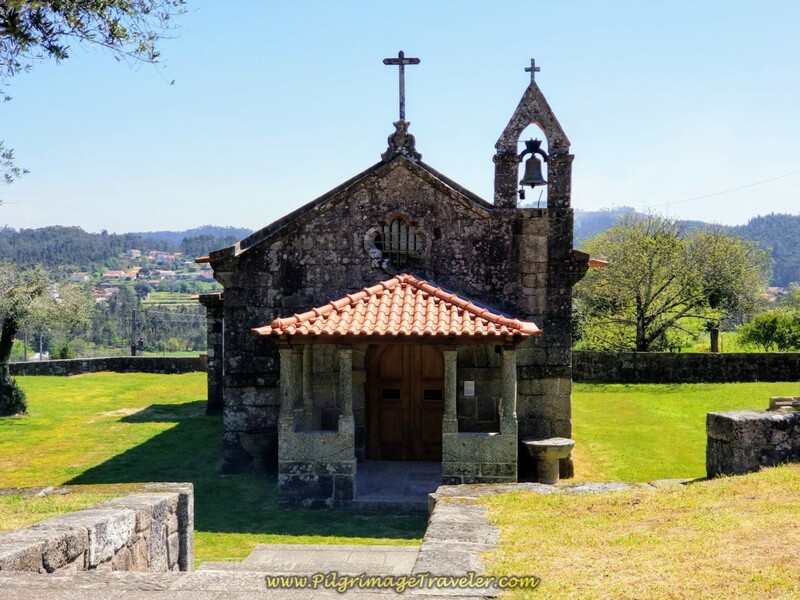 After about 1.5 kilometers from our break spot, this wayside chapel appeared, below, along the Caminho de Casias. 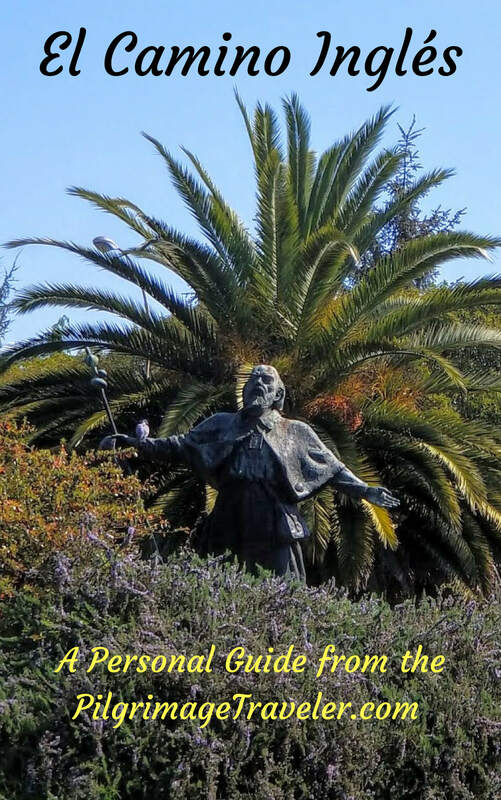 I have not been able to discover its name, but I loved the shrine to Santiago on the opposite side of the street! 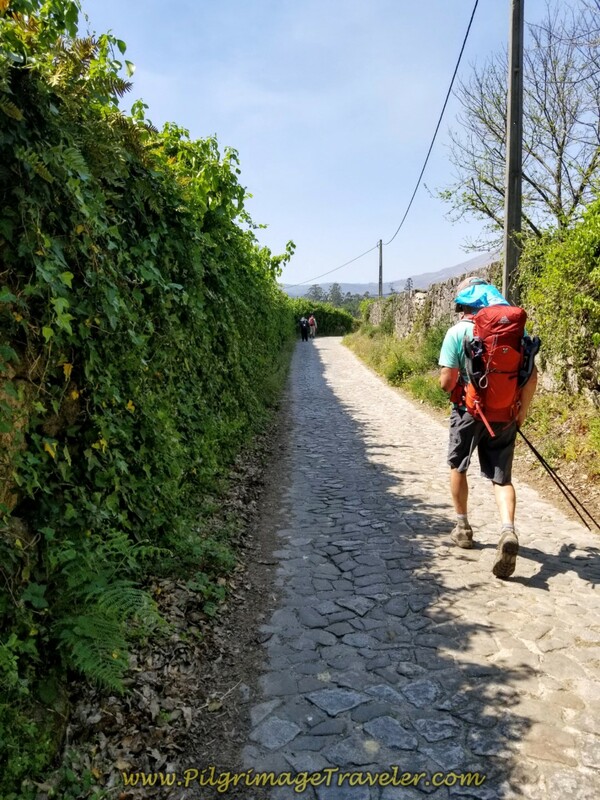 Within the next 2.0 kilometers the Camino was often made of true blue, real cobblestone, where actual stones were gathered to set into the street instead of pre-manufactured granite setts. It was amazingly quaint! Here is Rich walking on the Rua do Sobreiro. 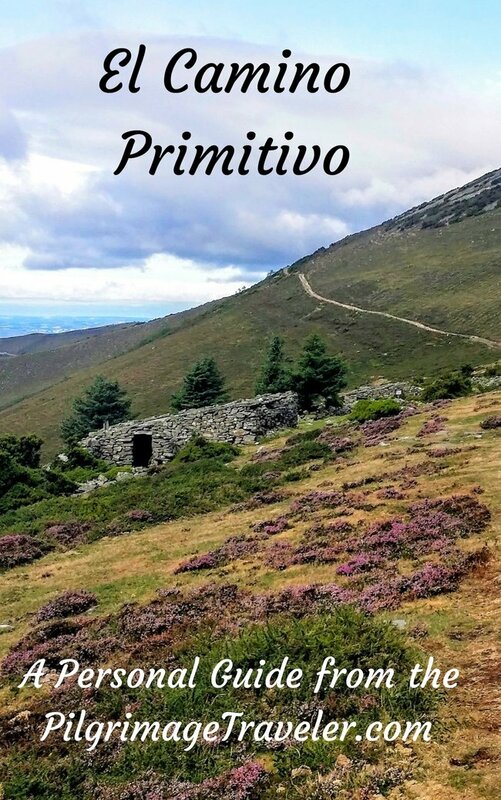 Just west of the Camino route and just before the N203, you can find the Albergue O Caminheiro, see above map. I have included a link to their Facebook page if you wish to shorten your day here. 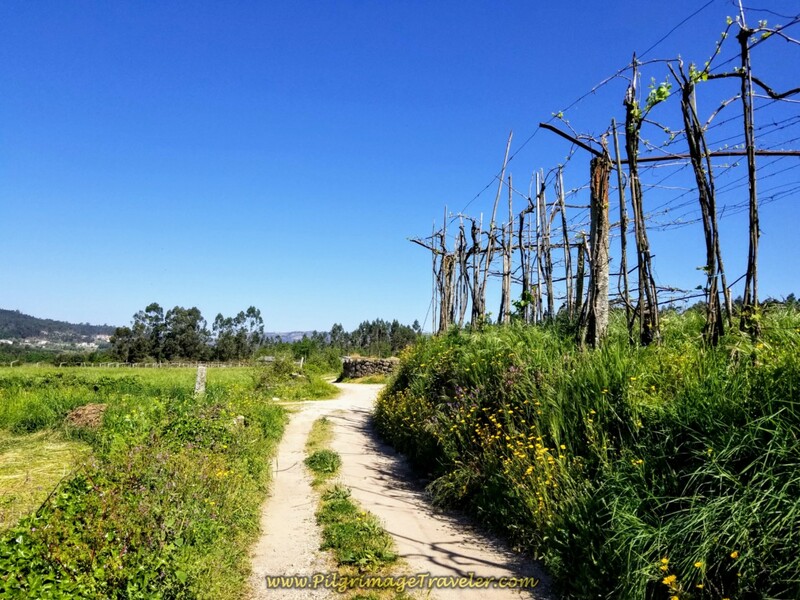 We came to and joined the N203 , then turned left onto another country road, below, the Rua do Caminho do Santiago lined with vineyards. 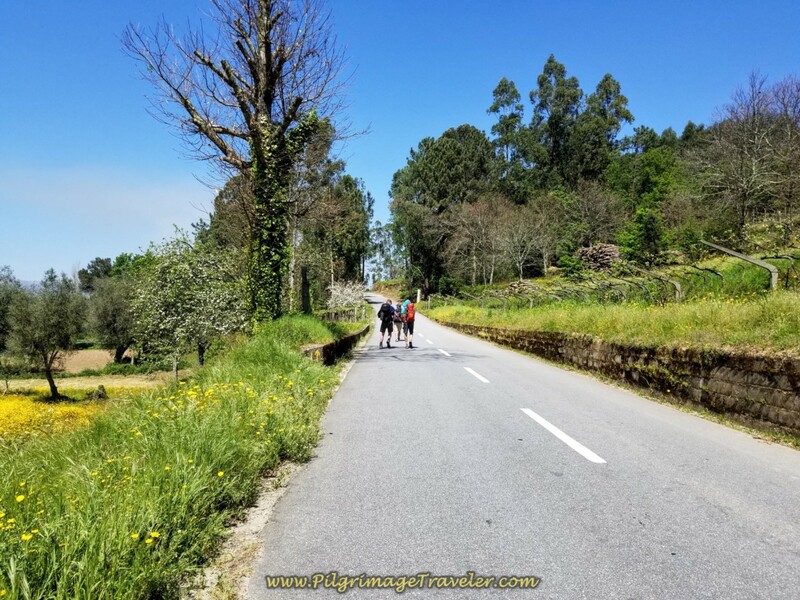 For over 2.0 kilometers, this Road to Santiago took us through the Portuguese countryside, getting closer to Ponte de Lima. 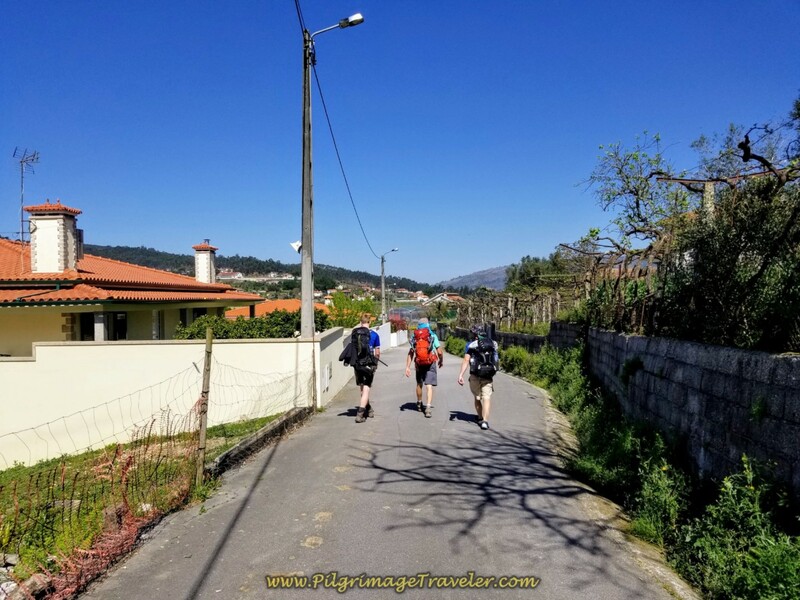 Below are Rich, Magnus and Matt, entering Paço, the next town. 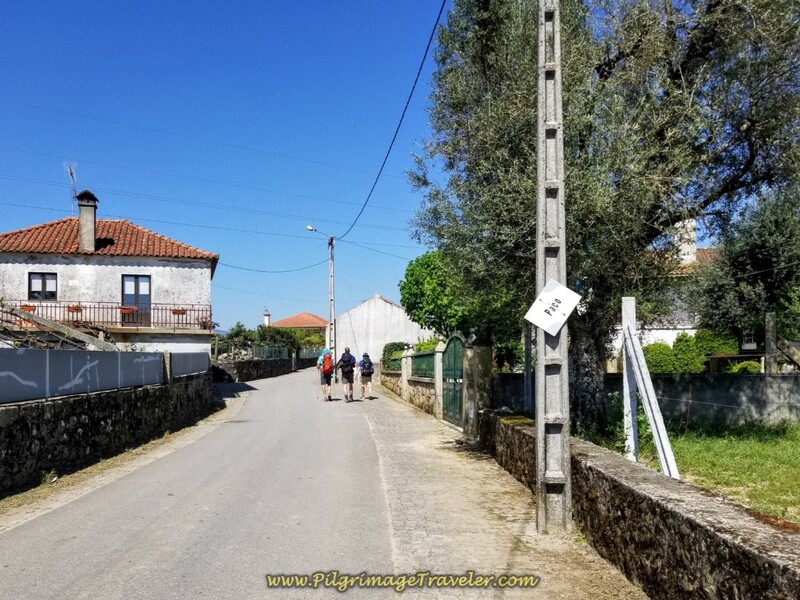 Walking onward to the next town of Barros in another kilometer, the kilometer countdown, on the small brown sign, below says "Ponte de Lima, 1 km." Almost there! 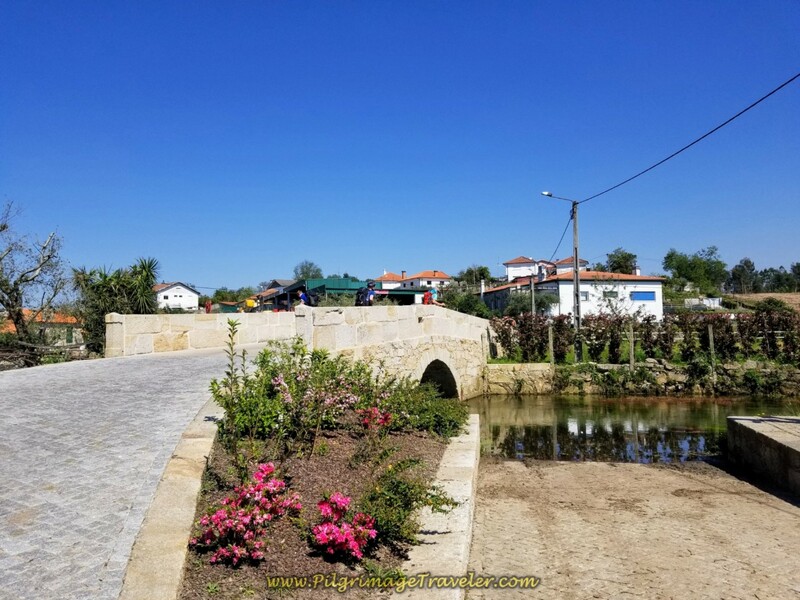 Barros is known for its attractive, small Roman bridge, the Ponte de Barros. 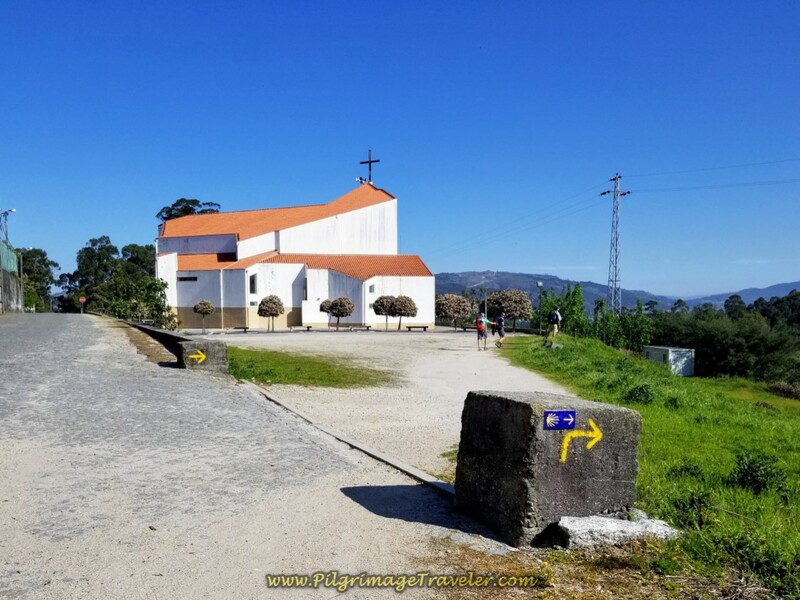 Our wonderfully named street, the Rua Caminho de Santiago finally ends at the bridge and the Way turns to the left and onto the Rua do Topo at this chapel, the Capela Nossa Senhora Das Neves. The Rua do Topo meets the waterfront of the Lima River in another 1/2 kilometer or so, and we joined this inviting, shady path, below. 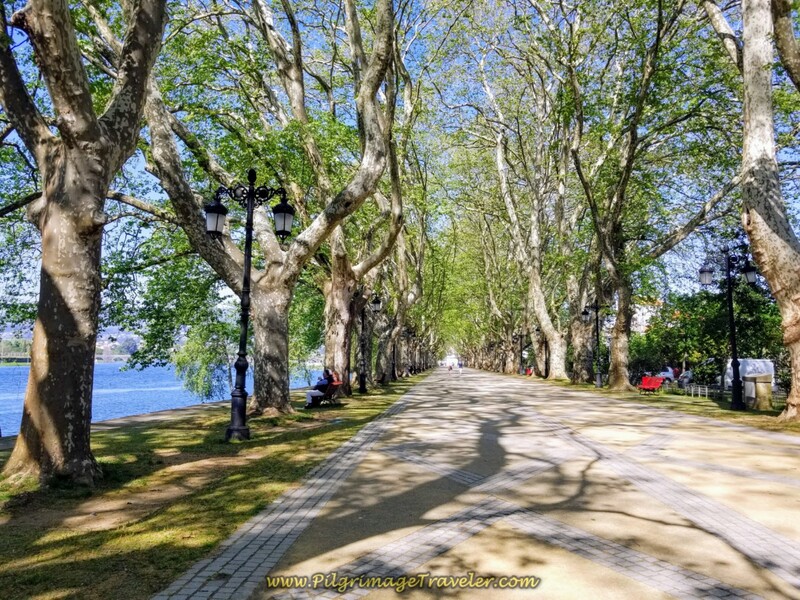 As you get closer to Ponte de Lima, the river path becomes the wide and lovely Plátanos pedestrian way as we continued to follow the Lima River. 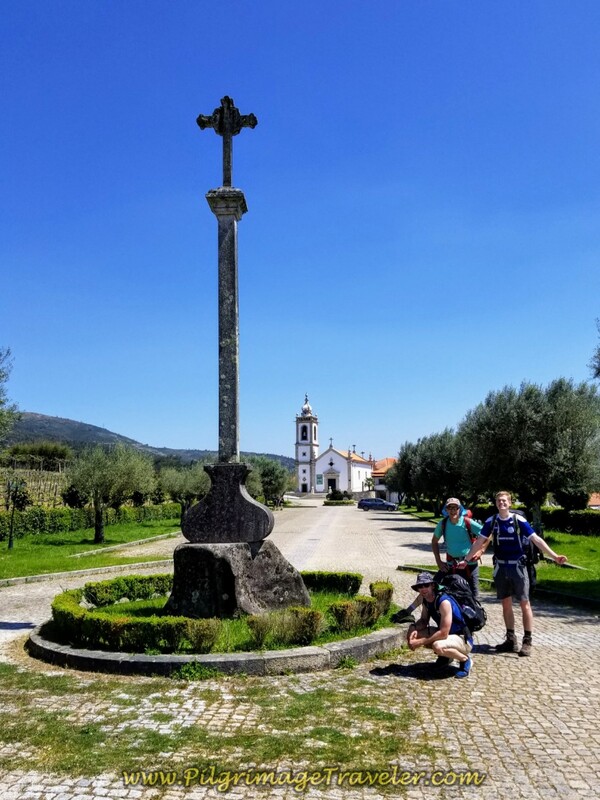 I was grateful for the end of day seventeen on the central route of the Portuguese Camino to be so inviting. I slowed down and savored the treat of walking through here. Between the trees along the pedestrian way, we caught sightings of the long medieval bridge, and the church on the opposite side. It was so picturesque and I didn't hesitate to take lots of photos! Here one of my best, below. The first two accommodations you come to as you near the center of town are the Pousada de Juventude and the INLIMA Hotel and Spa. 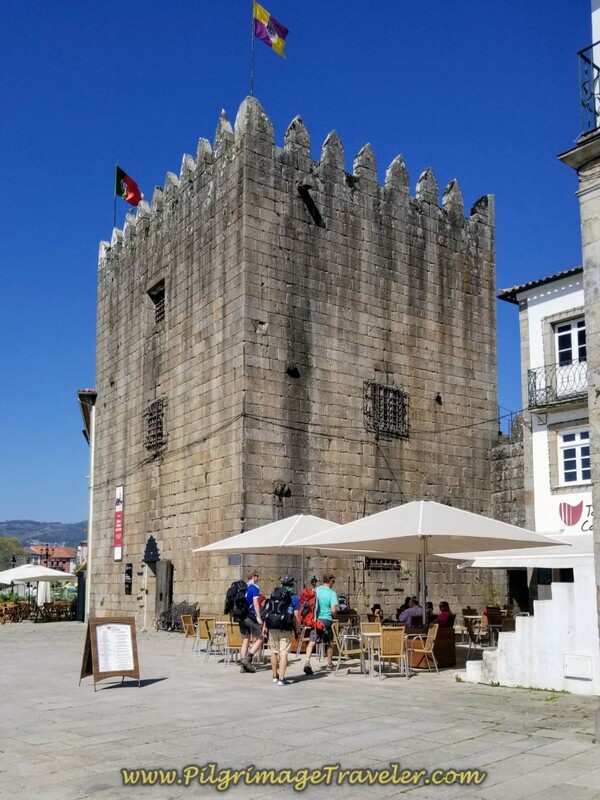 And then we were in the center of the city, still walking along the river when we encountered the first medieval tower, the Torre da Cadeia Velha, below. There was an extremely inviting café by the tower and without a moment's hesitation, the three gentlemen walked straight toward it! Ha ha ha. Without hesitation, I followed! We had a wonderful happy hour at the Taberna Cadeia Velha in the shadow of the tower. We had beers, and I invited the young ones to join me in the Caldo Verde, the Portuguese version of the delicious, Galician Caldo Gallego, full of greens, and electrolyte-restoring salty chicken broth. 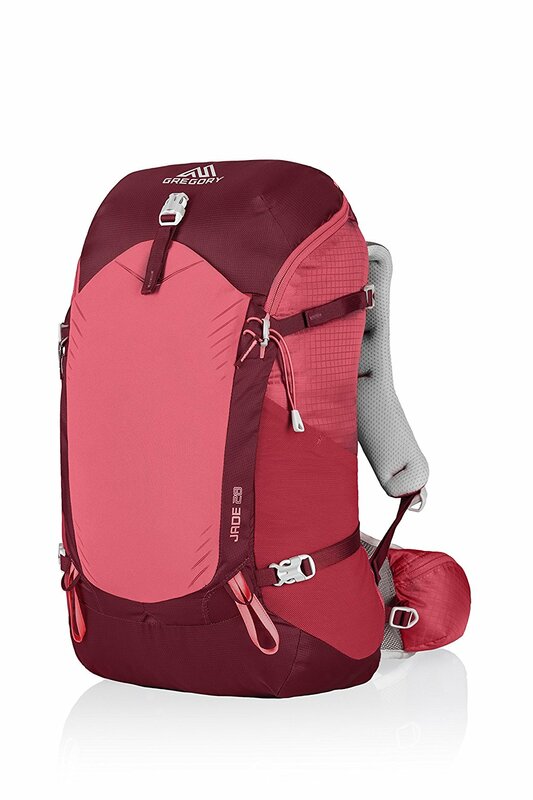 It was so nourishing to me after 34.5 kilometers in the hot sun! While at the Taberna, I contacted Magdalena and she rolled up. We watched the pilgrims, one by one, entering the city. I also heard from Pedro and Jorge, whom we had not seen all day, but agreed to meet up with again at the Taberna, later. Just past the first tower is a second, the Torre de São Paulo, shown below with a wonderful scene in blue azulejo tile. After our luxuriously long break, we went looking for a hotel. I wanted a good night's sleep after my miserable one at the last albergue. 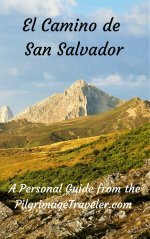 We ended up staying at the Casa da Vila in a private double room with shared kitchen and living space. While we did not cook dinner, we did have a nice breakfast here in the morning to start off our day eighteen well. 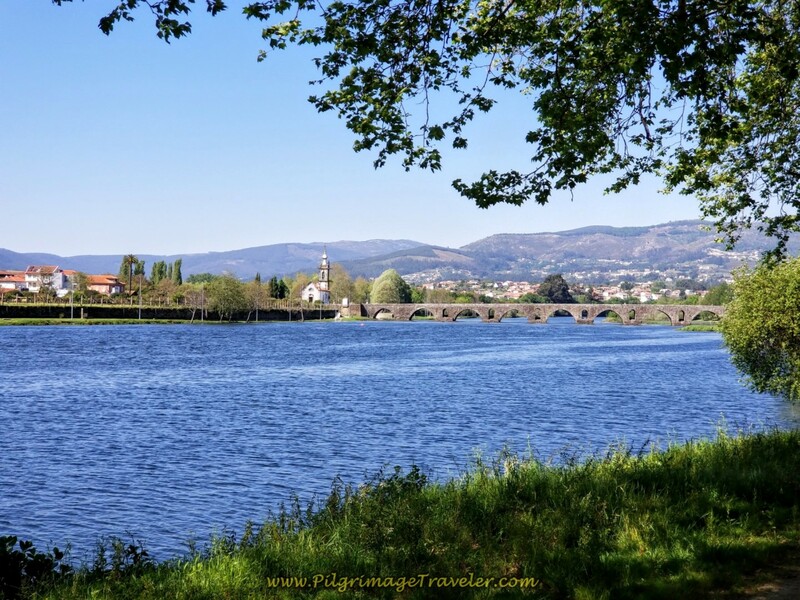 If you also want a reservation in Ponte de Lima click this link. There are so many accommodations, that I only put a few on our map above. 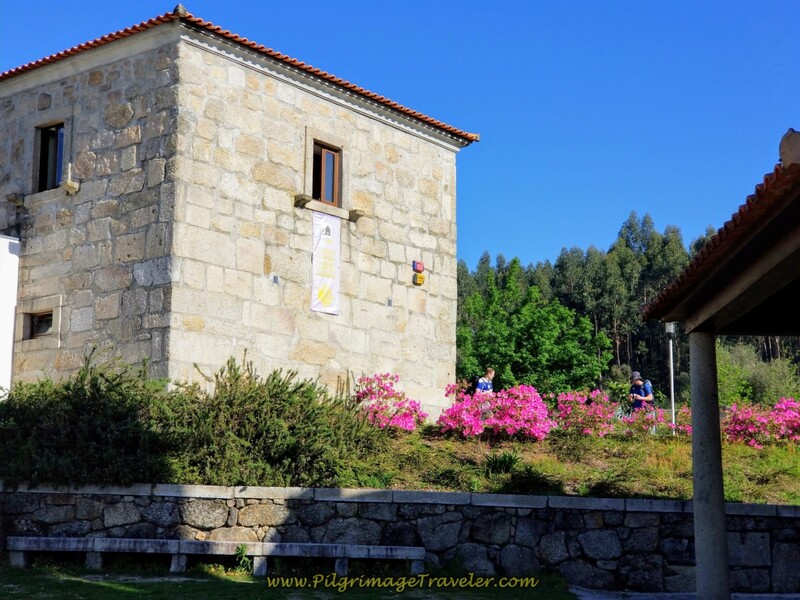 The Albergue de Peregrinos de Ponte de Lima is just across the medieval bridge and just past the church, the Igreja de Santo António da Torre Velha, on the right. All of the other pilgrims decided to go on to get checked into the albergue. We all met up again later at the Taberna by the tower. We joined a large group collected from the albergue about 1.5 hours later. I didn't drink beer this time as I felt I needed to hydrate more after the long day. With only one beer on this day, I found that I felt better the next. 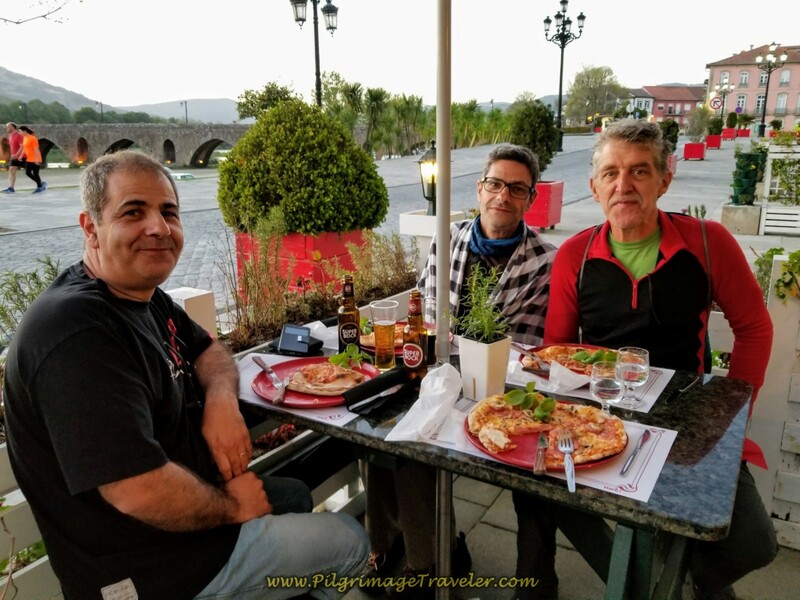 A group of eight of us went looking for a dinner venue, and chose a pizza and pasta place right along the waterfront, called the Orlandinho Fofinho-Pizzeria Beira Rio. Here we all are sitting outdoors having dinner. 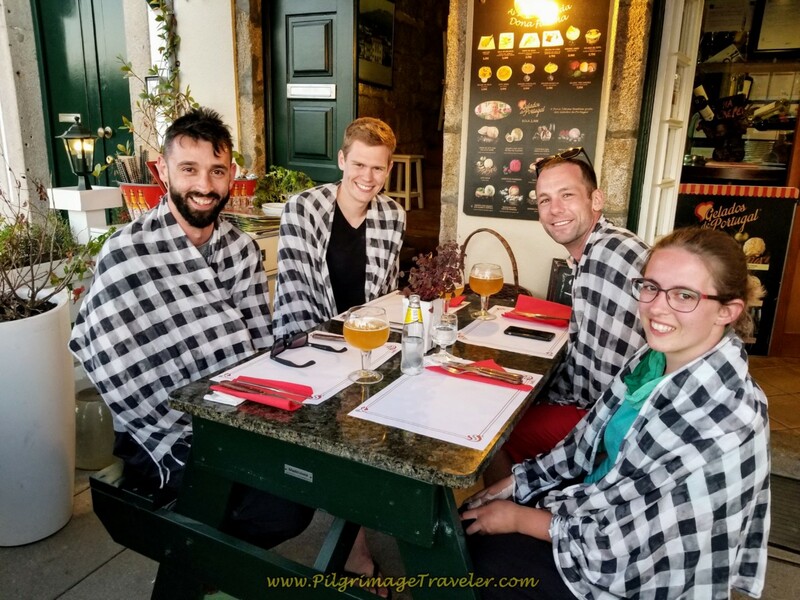 The restaurant provided us all shawls to keep us warm as the evening weather got cooler! Ha, what a picture! We picked up another Camino family member, Borut from Slovenia, on the left. He was a bucket of laughter with his hearty personality that added a lot of vibrancy to our group! And on the table across, are our Portuguese friends that also joined us for the evening meal. They had a tight schedule to keep, so this would be our last evening together as they would combine the next two day's stages. 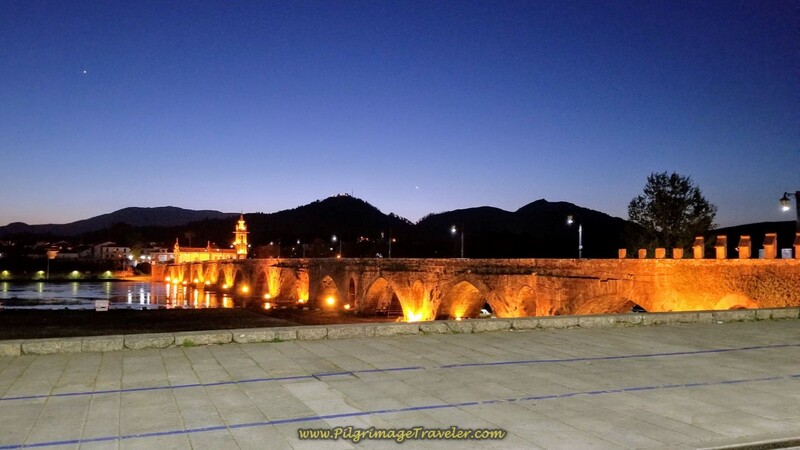 I leave you with the most gorgeous of sights, the medieval bridge of Ponte de Lima at night. We gazed at this wonderful sight, contented and with bellies full, ready for slumber! This day seventeen was a special day for us, full of special and touching moments! We made our own way, apart from Magdalena for the larger portion of the day. As Rich says, it was time to let the baby bird leave the nest. Later Magdalena confessed to me that indeed, when she was wheeling along the highway, many, many cars slowed down and asked her if she needed anything. I am close to tears just writing this down now, as I truly should have known she would be alright! My protectiveness was unnecessary, as the Portuguese human heart was tapped deeply for her, wherever she went! She did not need my help! I felt less remorse for my feelings of needing the break this afternoon. She was proving indeed, that she could make her own road. There was a time to be dependent and there was a time for her to be independent. She had shown her true colors. She was capable of so much more that I had given her credit. What a treasure she is! 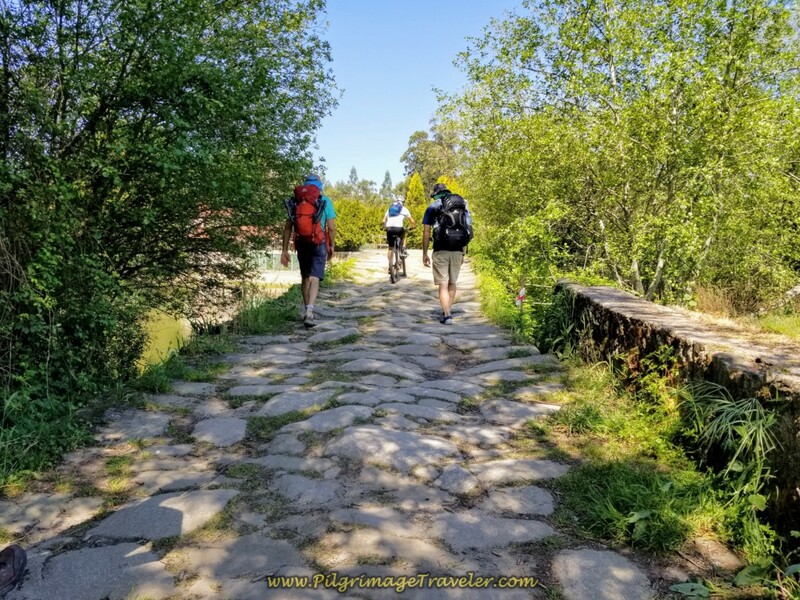 May your own day seventeen on the central route of the Camino Portugués be filled with special moments as you make your own road, whether alone or together with other pilgrims. May you have the courage and persistence of one such as Magdalena! Ultreia!